Well as of this blog, it is new year’s eve and soon it will be 2015. I cannot believe how fast 2014 has gone, but then again time moves so fast if you have been so busy, and yes I have been so busy during 2014. What did I get up to? What were the highlights? On the 18th Of December 2014. 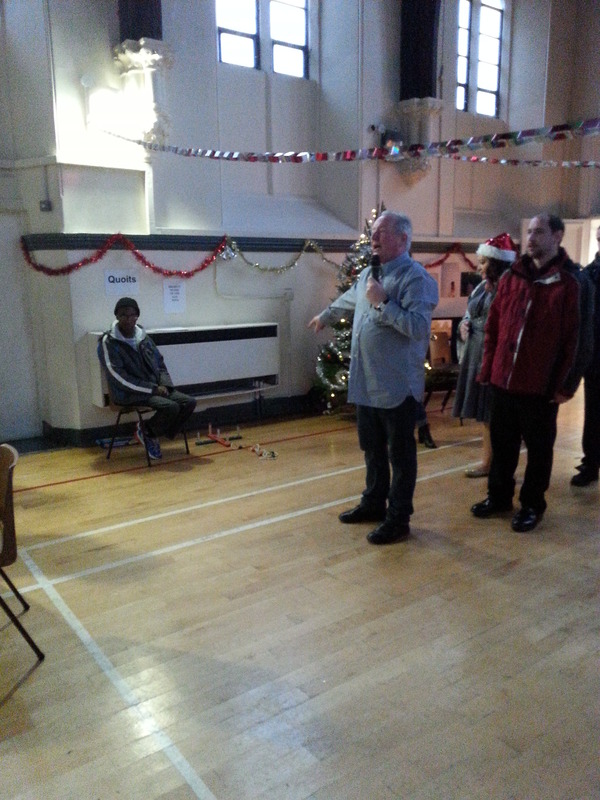 I enjoyed the Lewisham Mental Health Connection Xmas party. 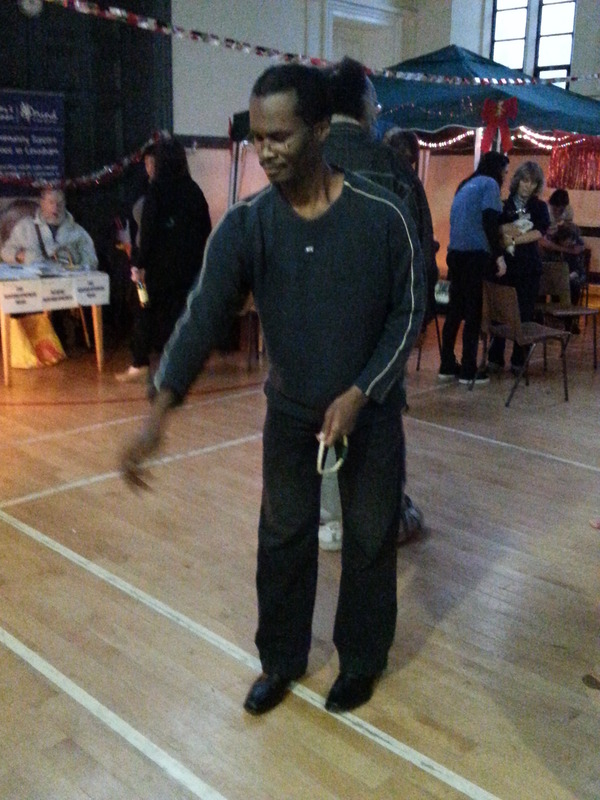 There were lots of activities, having fun and being part of the community. I met many old and new friends and hope to contribute and help the LMHC in 2015. 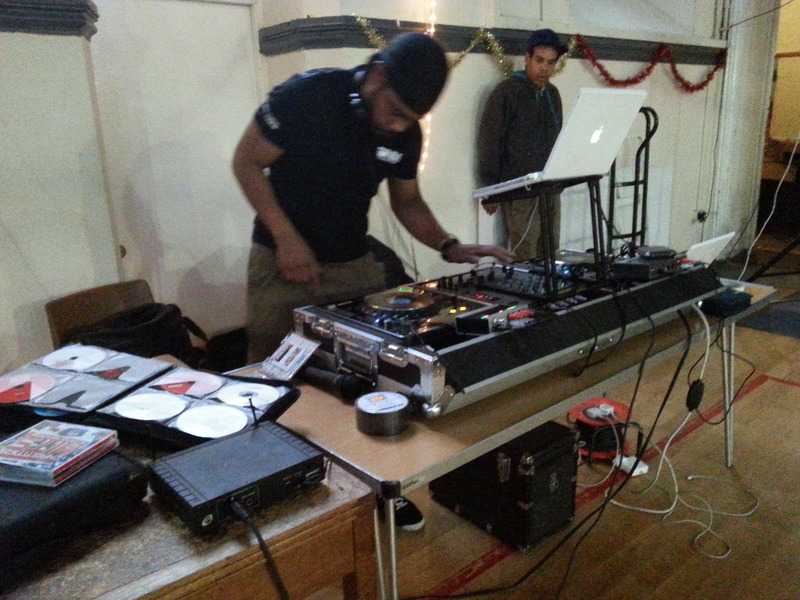 On the 15th Dec 2014 at Lewisham civic suite. 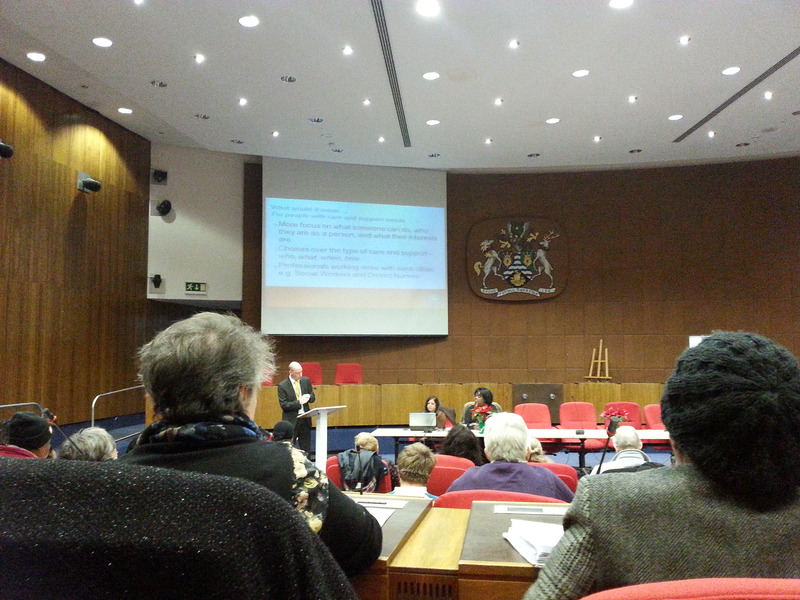 I attended the Healthwatch Lewisham Annual event where we got updates on what Lewisham Healthwatch has been up to, plus the 2014 Care Act was explained and we got a chance to influence Lewisham Healthwatch priorities for the coming 2015. On 12th of December 2014. 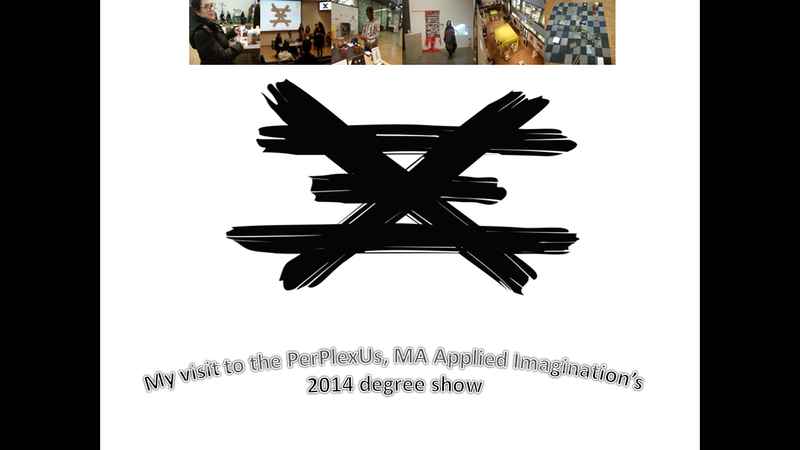 I headed over to PerPlexUs, MA Applied Imagination’s 2014 degree show. 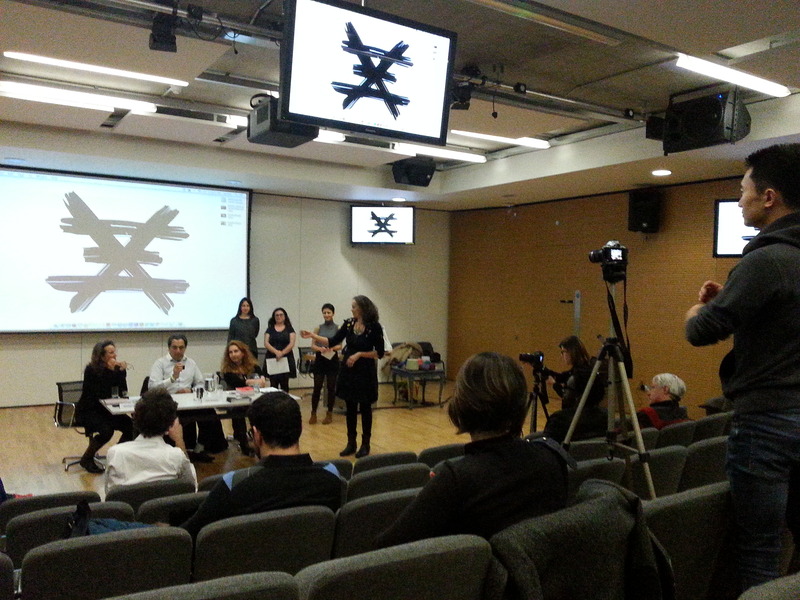 This took place over at one of the University of the Arts London sites. I met my friend Adele Orcajada who explained her Yarn work and project, plus I got the chance to visit many more of the other students art projects and participated in their group sessions. 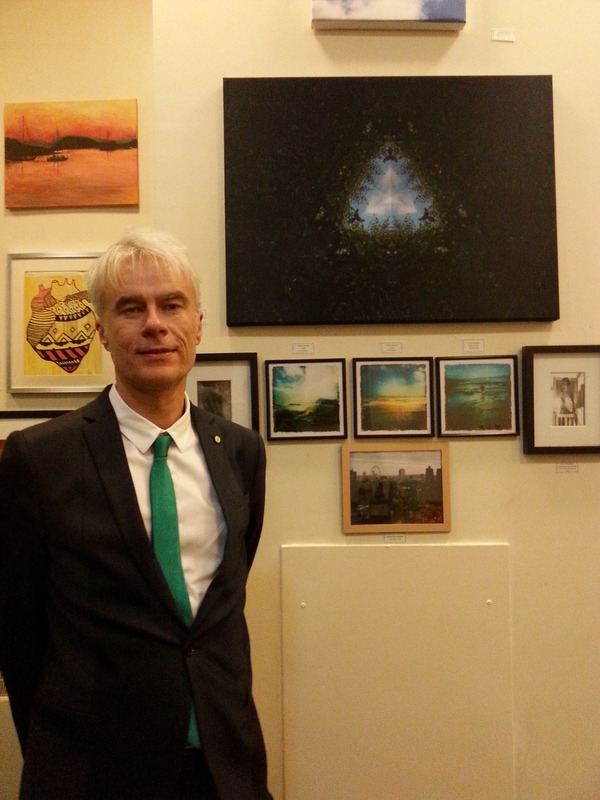 On the 10th of December 2014, I attended the SHARP gallary which stands for Social Inclusion, Hope and Recovery Project. This is where I got to visited and view many of the mental health trust staff art work. There were lots of hidden gems to find and I enjoyed capturing all the creativity that was held at the gallery including the event itself. 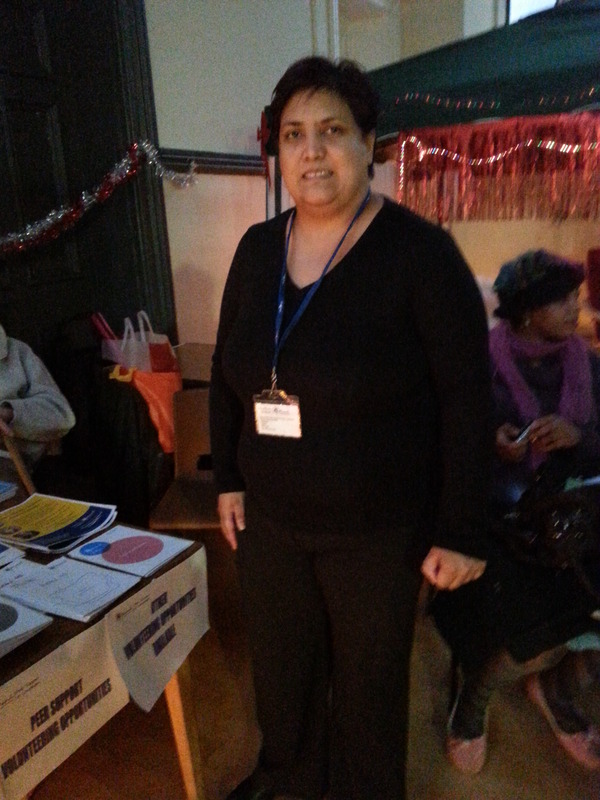 On the 22nd of November 2014, I took a trip over to Pembroke House over in Southwark to attended and capture the Southwark Healthwatch On Year on Event where we got to hear updates from the past year where Healthwatch Southwark have been very busy collecting stories of those who use the health services. 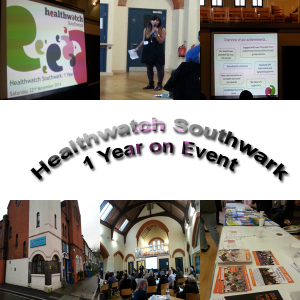 Healthwatch Southwark heavily engages with the public and those who champion health services. 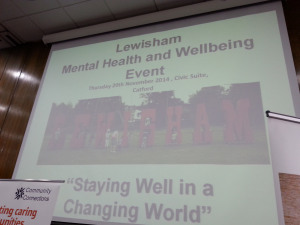 On the 20th of November over at the Lewisham Civic Suite, I attended the Lewisham Mental Health Wellbeing day which was presented by the NHS Lewisham CCG, South London and Maudsley NHS Foundation Trust and Lewisham Council. 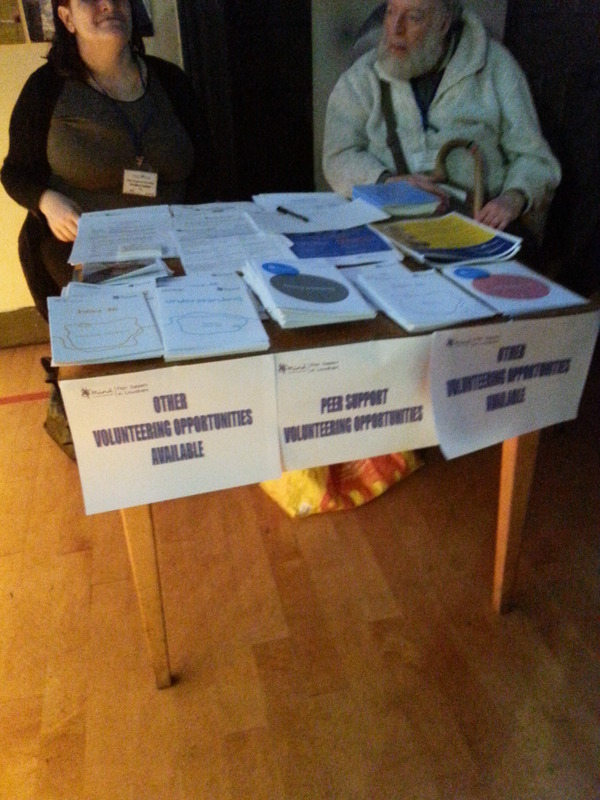 The MH and Wellbeing stakehold event wanted to concentrate on the service user/survivor aspect. 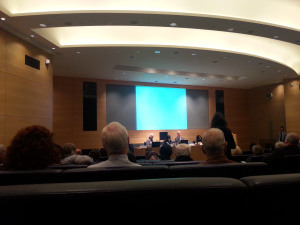 On the 13th of November 2014 I attended the CarersUK National. My friend and Carer representative Bridget Jones also attended along with another governor. We heard many updates and issues from CarersUK, plus I was lucky enough to have my blog included in CarersUK newsletter. On the 23rd of October 2014 I was lucky enough to watch an Opera performance describing the form of depression and the anatomy of melancholy. The Opera was a fascinating experience and a joy to watch, every actor kept my attention and there was so much to learn from the performance. On the 10th of October was an awareness day, this being World Mental Health day, which falls on the 10th of October each year. I managed to visit 5 events from the Lambeth & Southwark Mind stall, to the South East London Arts Network workshop at Horniman Museum. 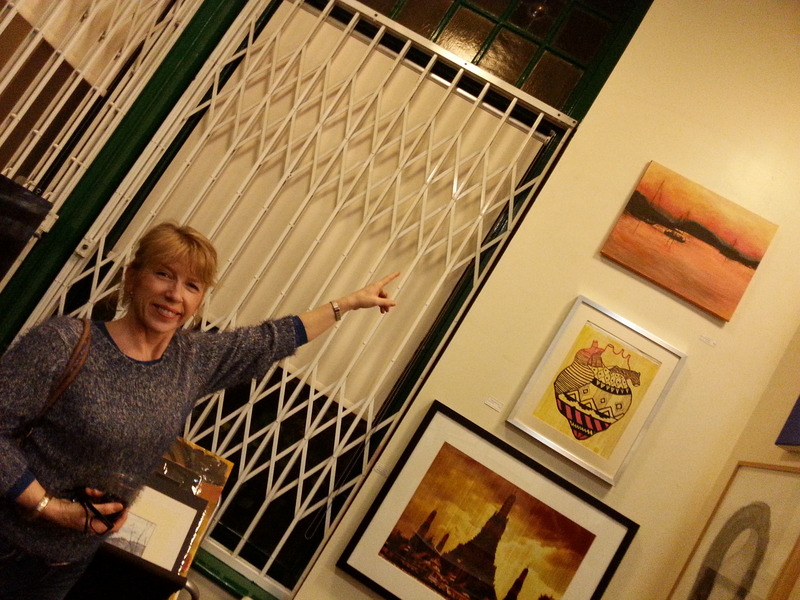 I even attened a series of talks at the GV Art gallery. Carers Lewisham held its AGM in 2014, this is one the most carers centers I use in order to get support for my caring duties. 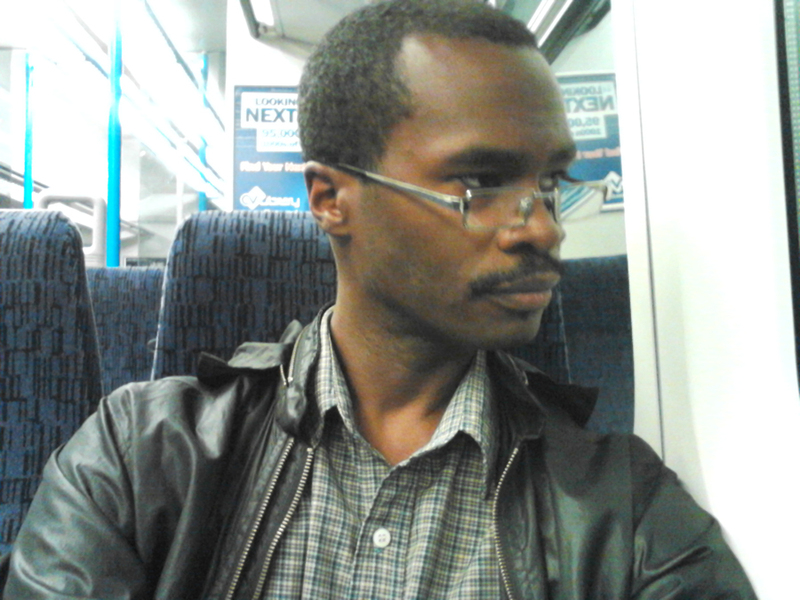 I have used Carers Lewisham for probably 8 years or so. At the AGM we heard what Carers Lewisham have been up to since their last AGM and we got to hear carers stories, including my own carer experience. 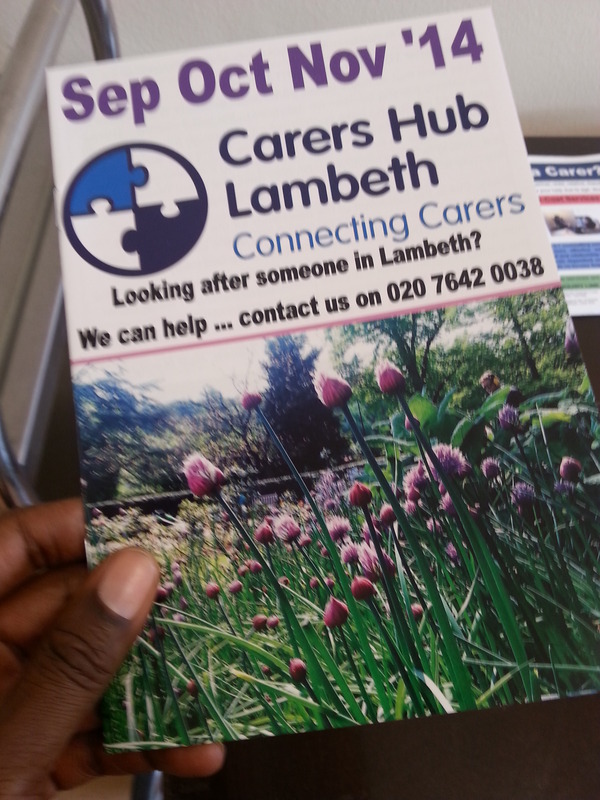 Lambeth runs around about 4 carers forums each year. I managed to attend and capture 2 of the forums. The forums are very large and although not all carers are mental health carers you can at least capture the general field of what carers go through and what issues are raised. 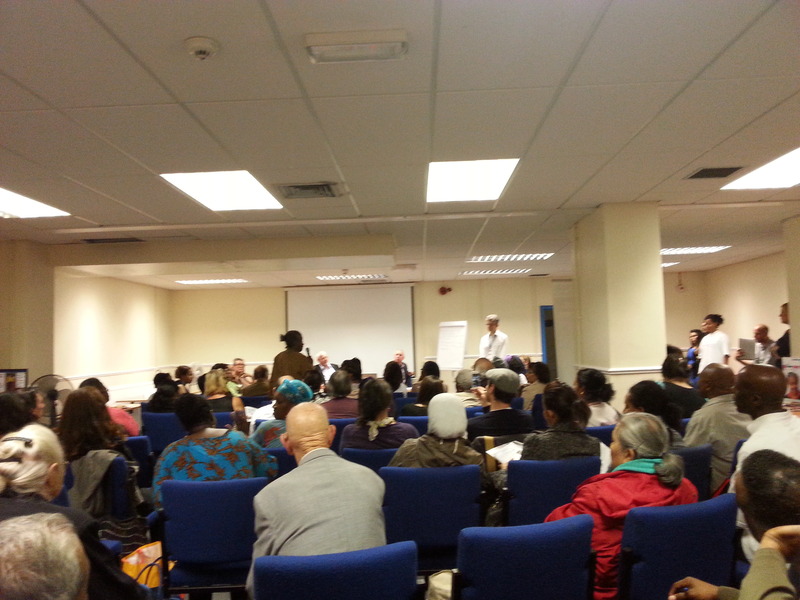 The South London & Maudlsey Foundation Trust run family and carer’s conferences each year. 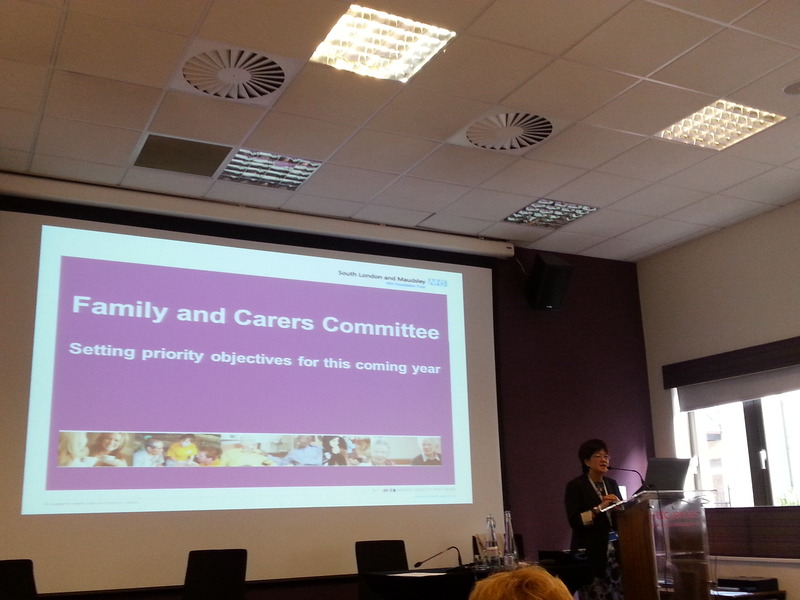 I was lucky enough to help plan and participate in the conference where families and carers get the chance to be informed of the work and updates the trust is doing to help families and carers of those using the services. 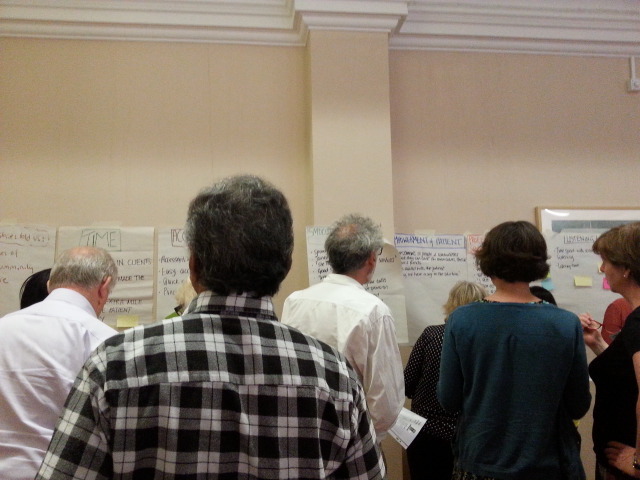 There were lots of speakers, stalls and activities at the conference, I hope to blog about this soon. 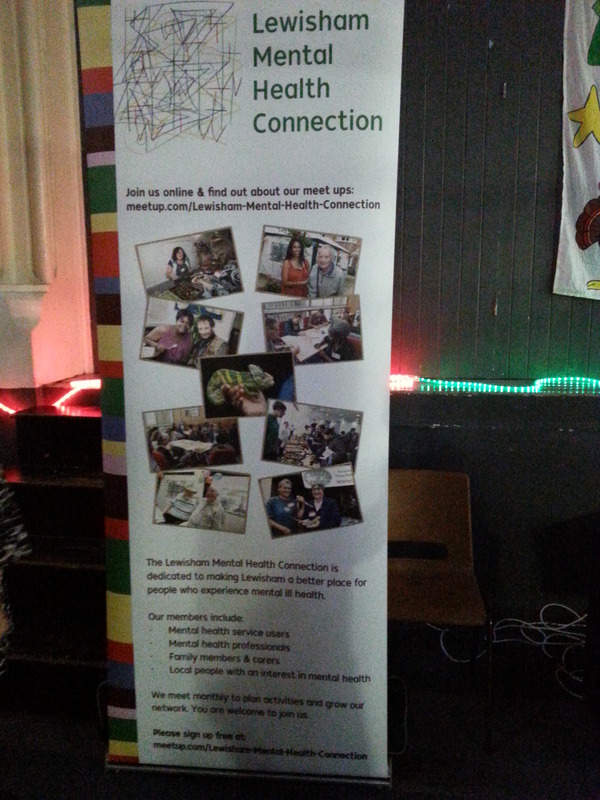 The Lewisham Mental Health Connection ran another of their yearly conferences and this one took place at the Lewisham Civic Suite on Thursday 11th September. We got to hear from many speakers in the field of mental health and volunteering, there were many workshops and stalls and I got to hear from friends who influence the field of mental health. 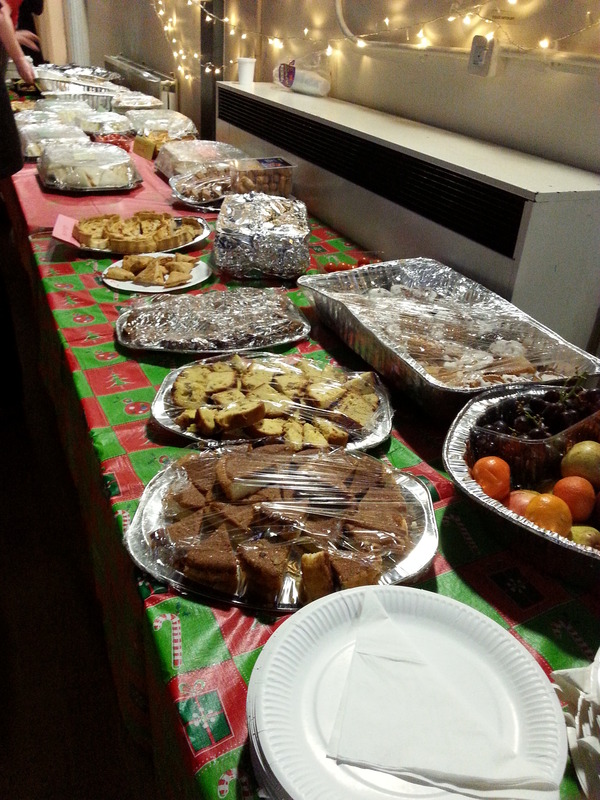 Healthwatch Lewisham run many engagement events and one of them focused on community care. 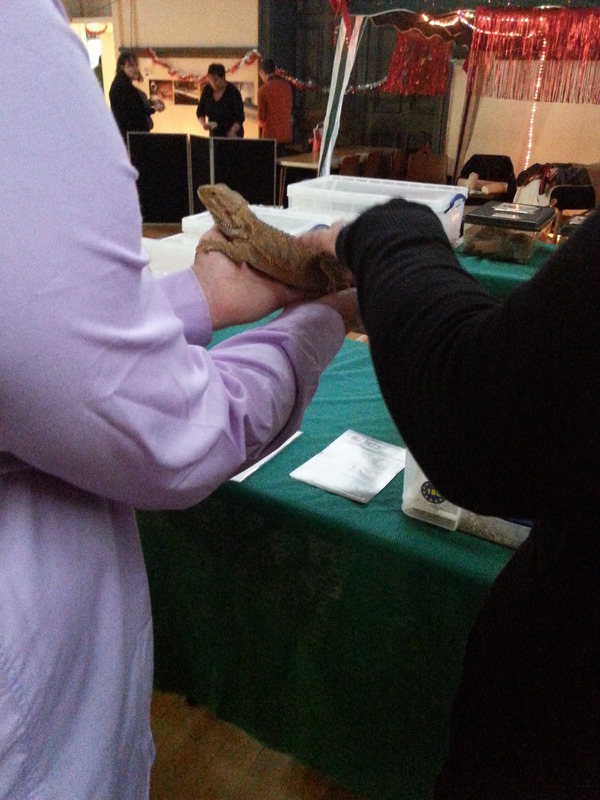 This event was held over at the Lewisham & Greenwich University hospital on the 28th of June. There was many great ideas from the event coming from those passionate about the community and passionate about healthcare. 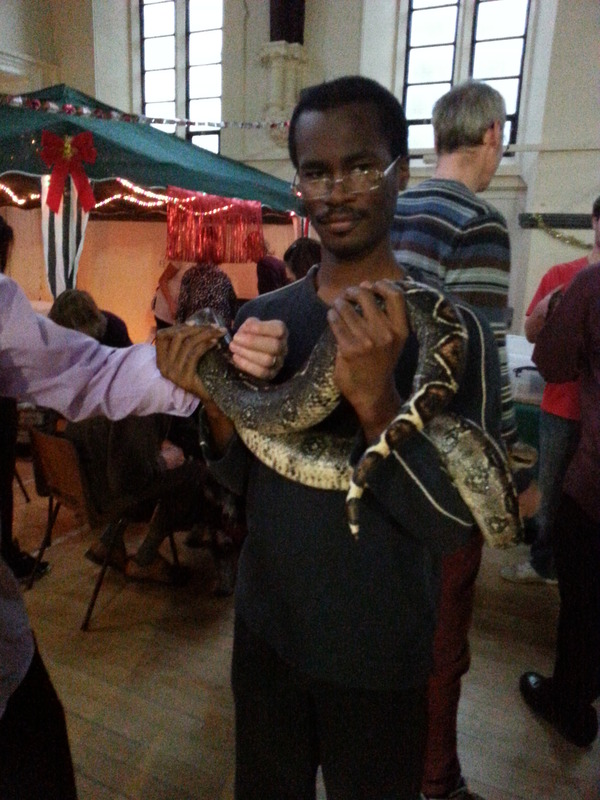 The event was run in partnership with the Save Lewisham Hospital campaign. Those who have learning disabilities can unfortunately develop mental ill health, but what things are being done to help those who have those challenges? 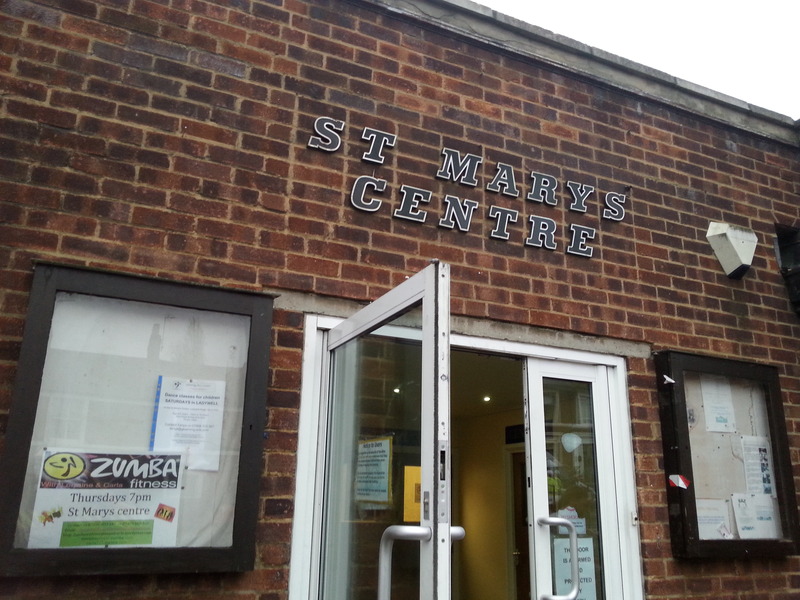 I was asked to cover the Wellbeing event over at the Maudsley Learning Center situated over at Denmark Hill. This event was huge and practically used most of the building. There were many stalls ranging from health eating, mental health projects, healthy and active lifestyles and also workshops. 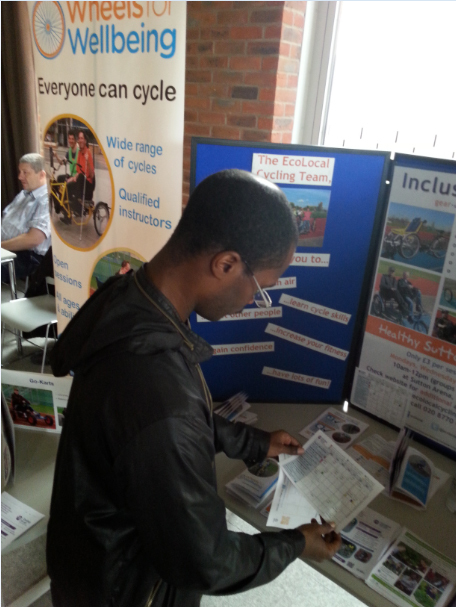 I was most impressed with the involvement from those who use the services at the event. 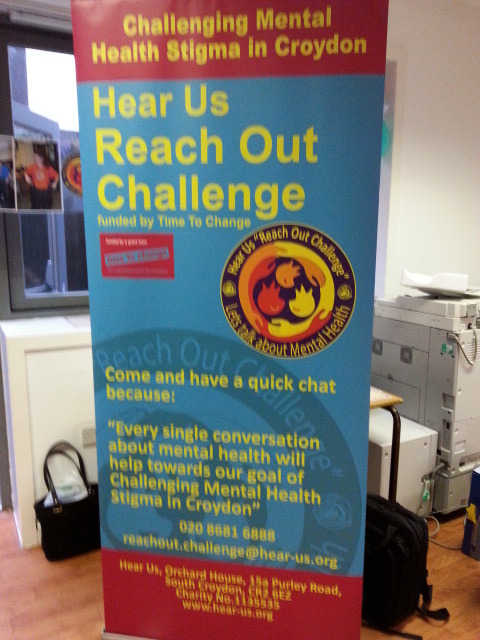 Hear Us is the Mental Health Service User Group which acts as a coordinating body to facilitate, and ensure service users involvement in the planning, delivery and monitoring of mental health services in Croydon. 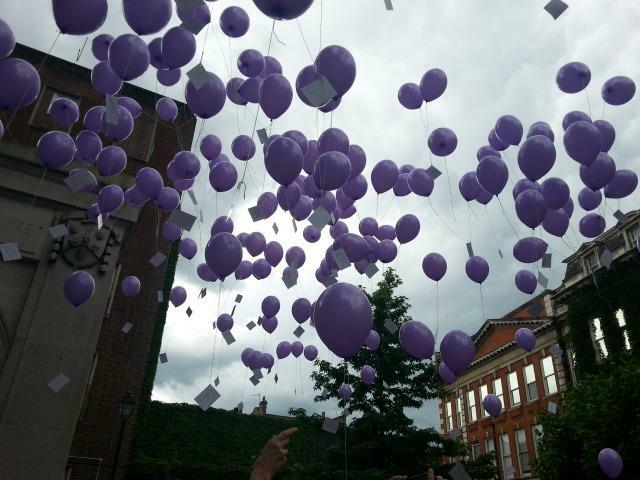 They have gone from strength to strength ever since the group started and this event was to celebrate their archievements. I was impressed with the presentations and stories from those with lived experiences. 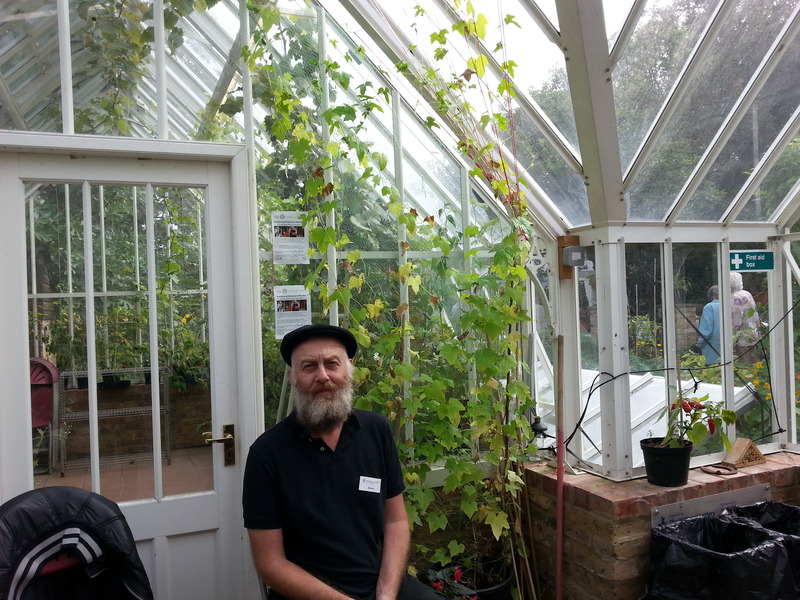 On saturday the 27th of September, I was lucky enough to attend the sydenham Garden Autumn fair and lucky enough the weather was just right for it. 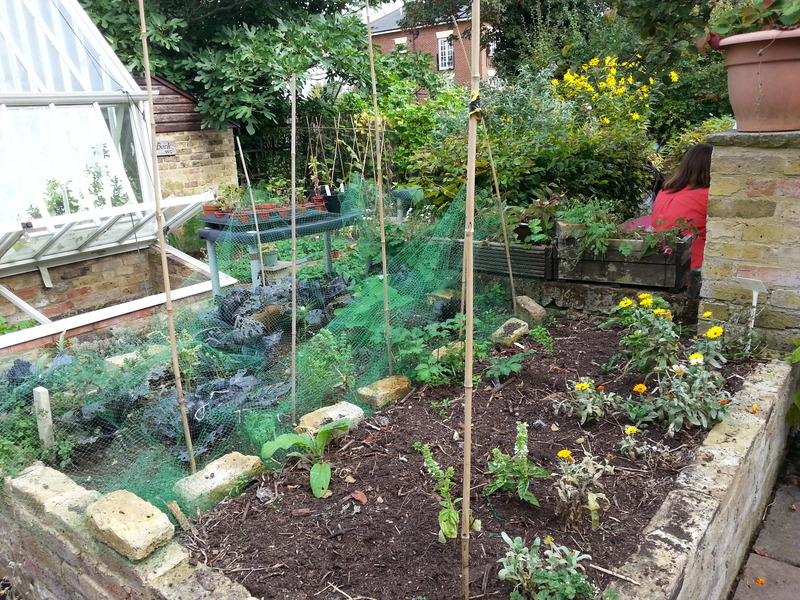 Sydenham Gardens is award-winning charity providing gardening, nature conservation & creative opportunities for the well-being residents of Lewisham. 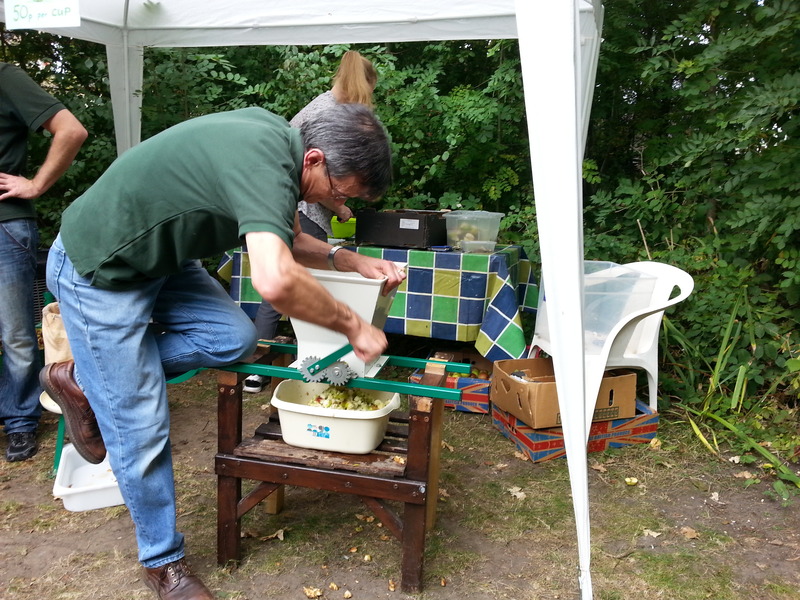 At the fair was music, children’s activities, apple juicing and a chance to visit many of their gardens. 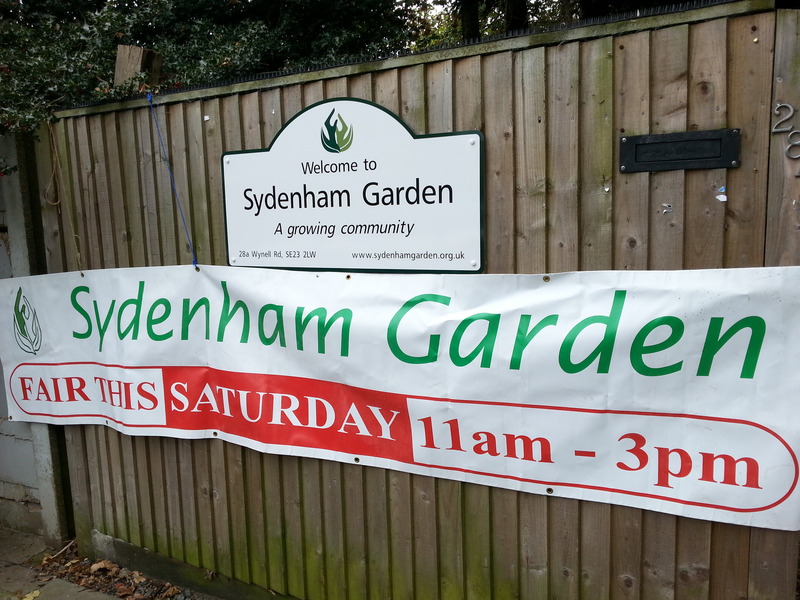 Sydenham Gardens are also a member of the Lewisham Mental Health Connection. I visit quite a few healthwatch events and other healthwatches are happy enough for me to promote and blog their events. 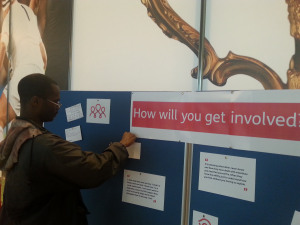 Southwark healthwatch held the Social care event in 2014 where we got to hear what they are doing for Access to GP services, Access to Mental Health services, Sexual Health Services, specifically HIV and of course Social Care. 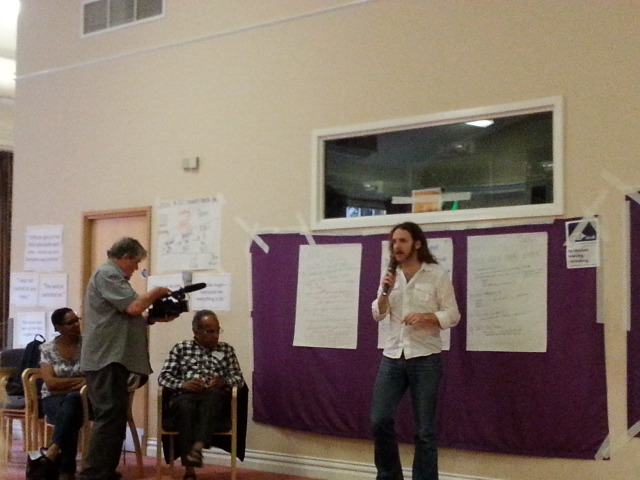 We also had the oppertunity to influence what needs to improve social care in the borough. 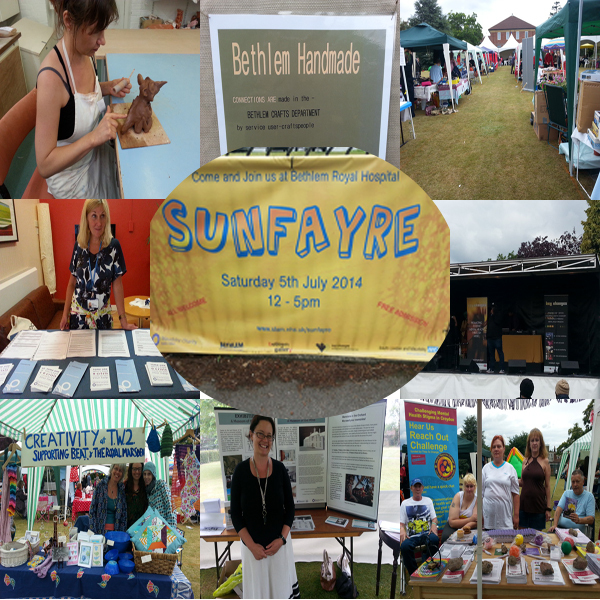 On Saturday 5 July 12-5pm I decided to visit Bethlem Hospital grounds to attend the Bethlem Sunfayre 2014. 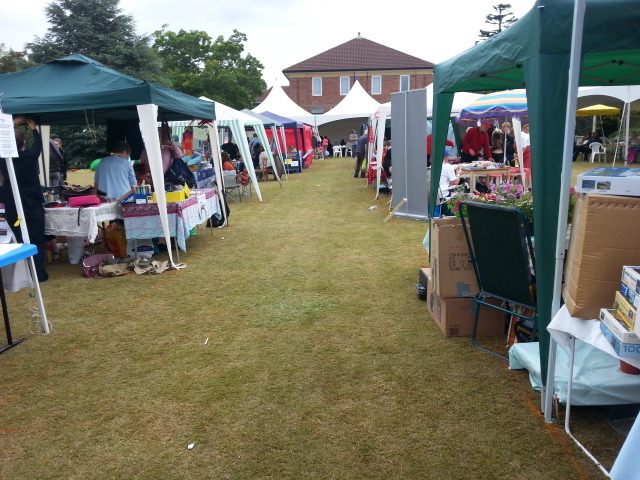 Each year they hold the Bethlem Sunfayre where there are some of the stalls selling various wares, plus five zones. 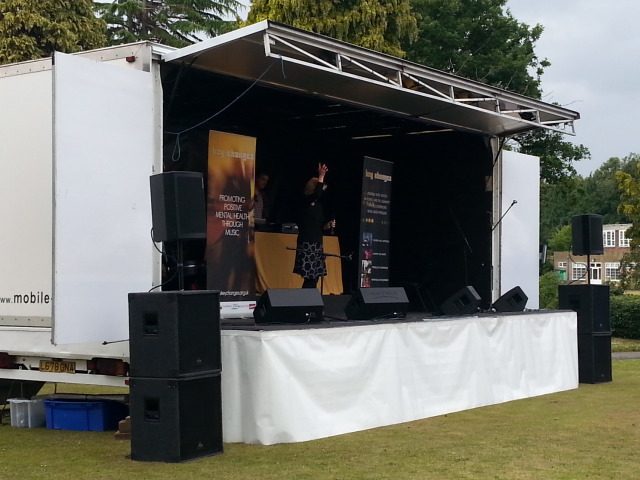 There were BBQ and music and entertainment stage, Art workshops, ceramic workshops and the Bethlem Gallery plus bethlem Archives and Museum. 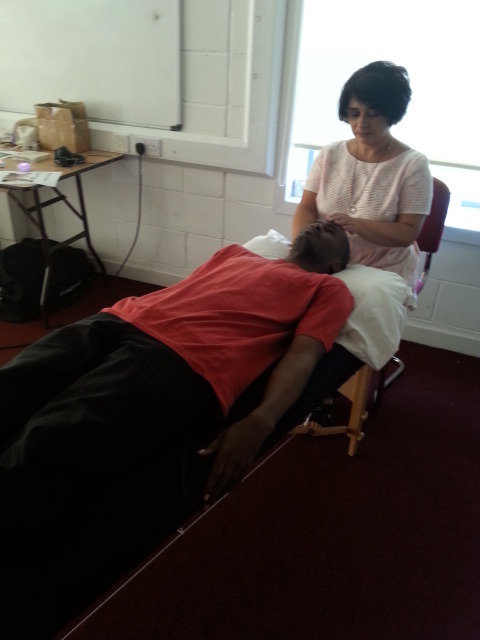 There was also a Community Centre, Complimentary therapies and cafe. 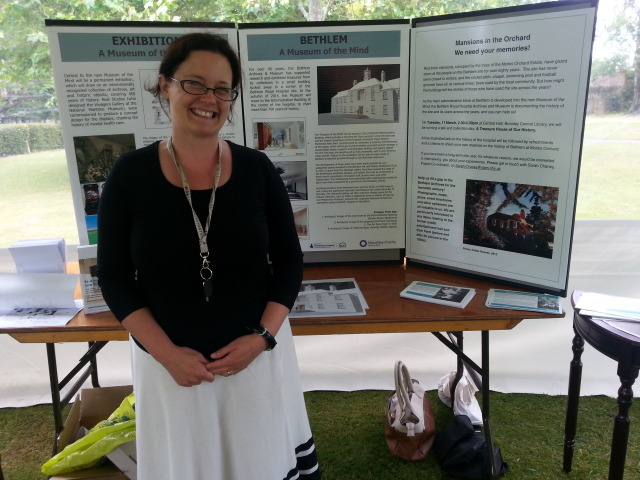 I spoke to Victoria Northwood on the developments of the new Bethlem Museum. 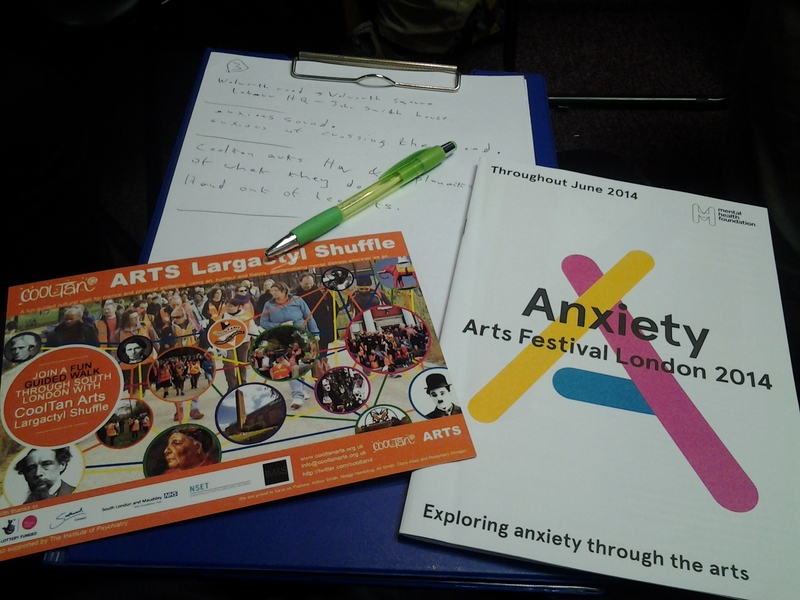 The Anxiety 2014 is a London-wide arts festival taking place at multiple venues throughout June 2014 and I attened around 5 of the events and blogged, video blogged and captured a few events as well as networked with many of the attendees. 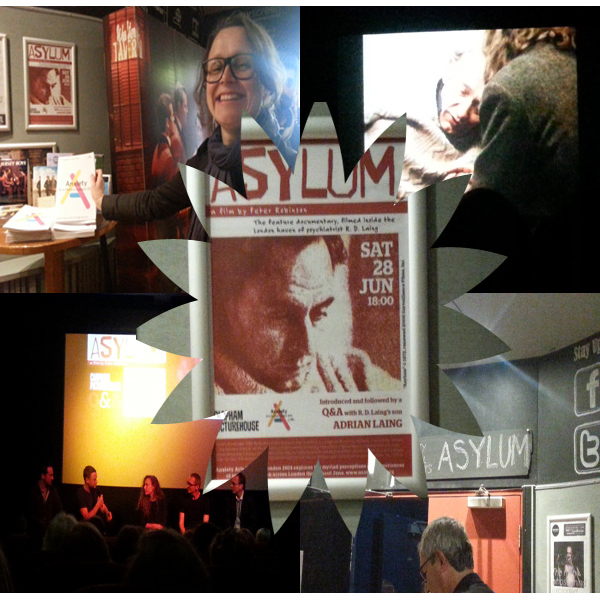 One of the events was a documentary on film maker RD Laing’s controversial Archway Community, testing Laing’s conviction that mentally ill people can only heal their shattered “self” in a space where they are free. 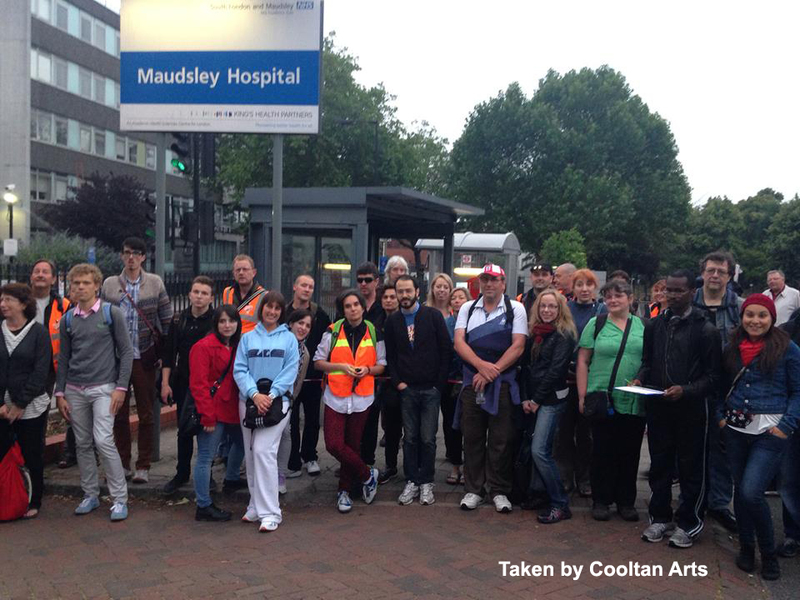 Cooltan Arts held their midnight walk, where about 130 walkers gathered for their Summer Solstice Midnight Walk on the 21st June CoolTan Arts is a a mental health and arts charity that believes mental well-being is enhanced by the power of creativity. I had an amazing journey on their 5 to 6 hour walk. We explored the area of Southwark and heard many stories and got to do some activities, however most importantly we learnt more about mental health and made new friends. 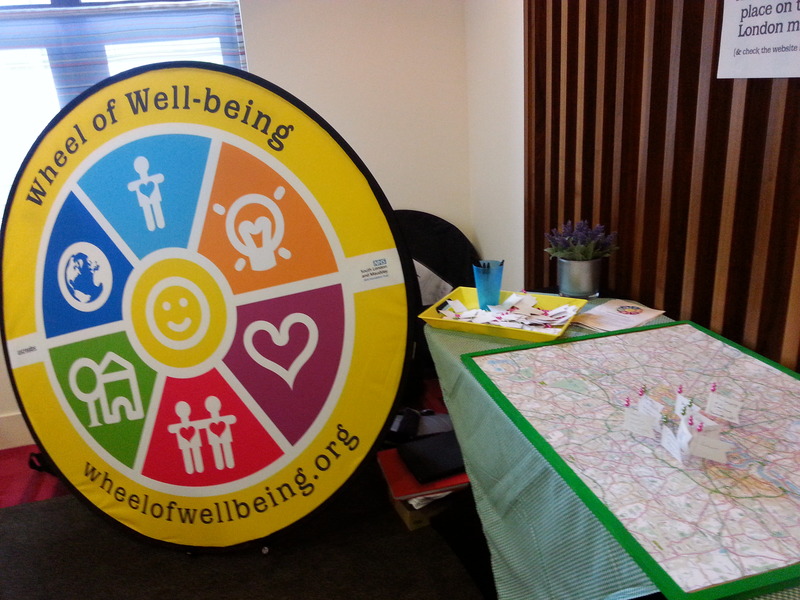 Back over in the London borough of Croydon on Tuesday 1st of July I attended the Hear Us wellbeing event where nearly 200 people, including those experiencing mental health problems, carers, staff and members of the public attended. 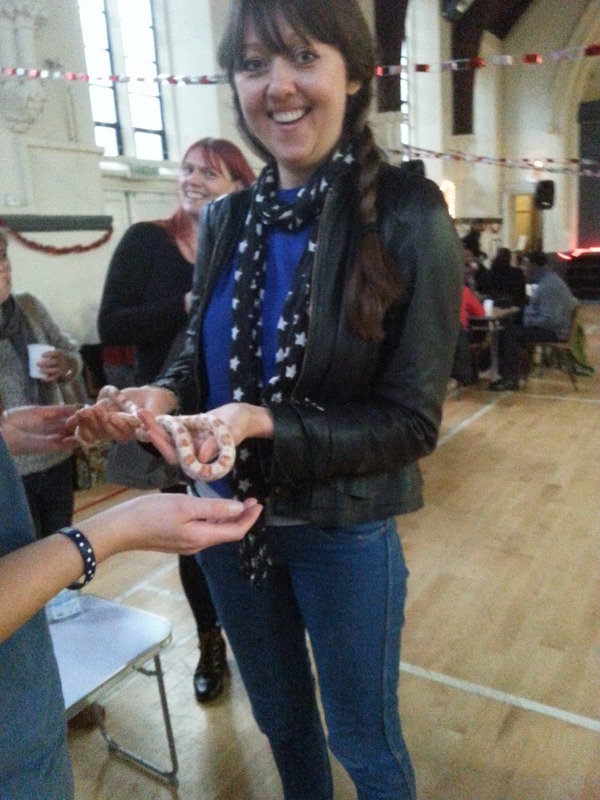 I took part in some football, visiting some stalls, had some massage therapy and viewed some creative writing. 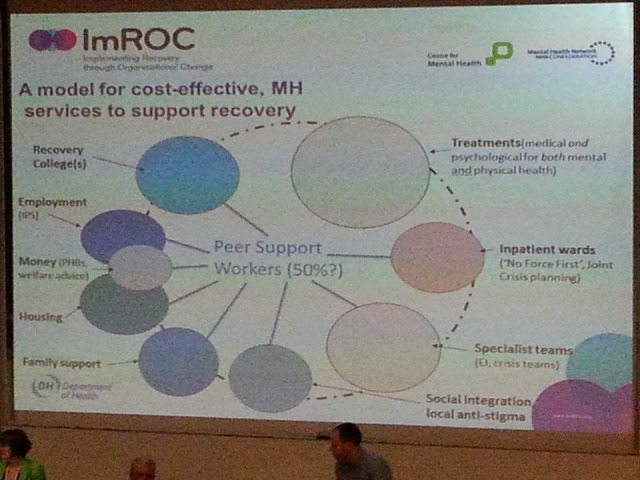 On the on 2nd and 3rd of June 2014 the Refocus on Recovery 2014 international conference took place over at New Hunt’s House at Guy’s Hospital. The conference had four themes being, System transformation, Relationships that support recovery, Recovery in crisis and Keeping well in daily life. 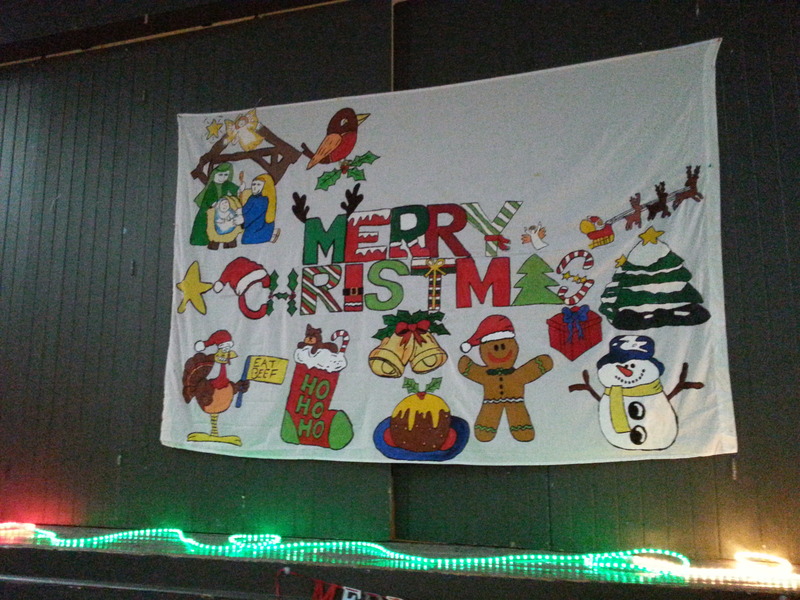 This entry was posted in Event reviews and tagged 2014 review, carers, event review, mental health on December 31, 2014 by mmckenz11. Welcome to another blog post on mental health and the world of caring from a carer’s perspective. You can check out my other blog posts which sometimes has posts about my thoughts on caring, mental health, reviews, videos and so on. 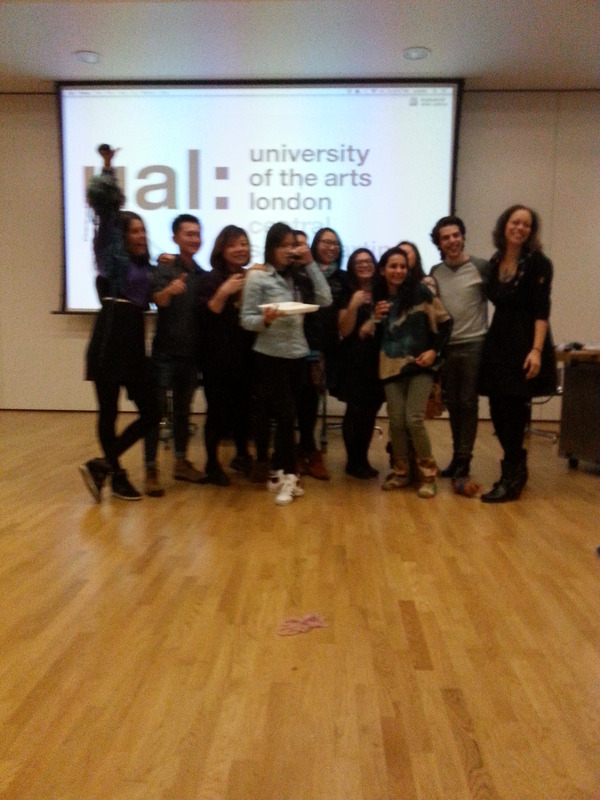 Now on this post I want to talk about another Art event I visited over at the University of the Arts London. 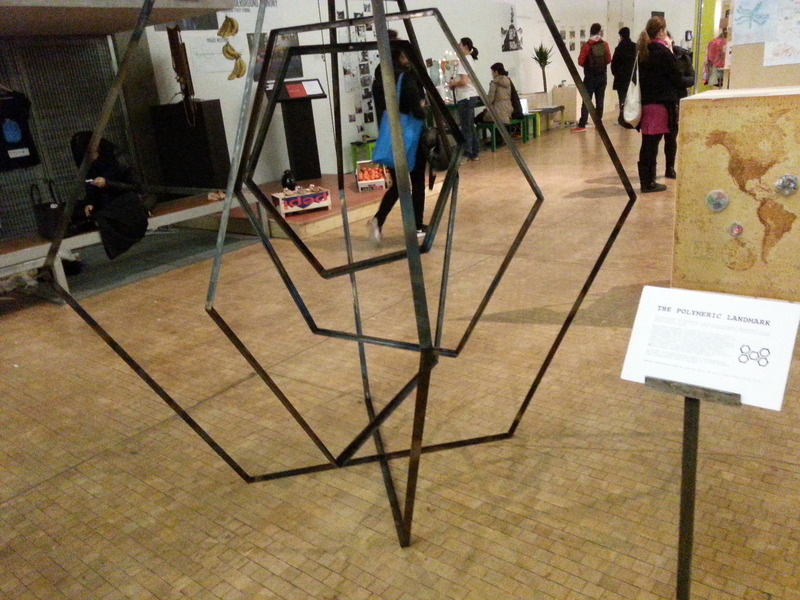 On friday 12th of December, I went along to the PerPlexUs, MA Applied Imagination’s 2014 degree show, which defies myopic ideology and social infrastructures. There were plenty of art exhibitions to view and I even managed to also stay for the talk by artists describing their projects and the work they have produced across the world via the power of collaboration. 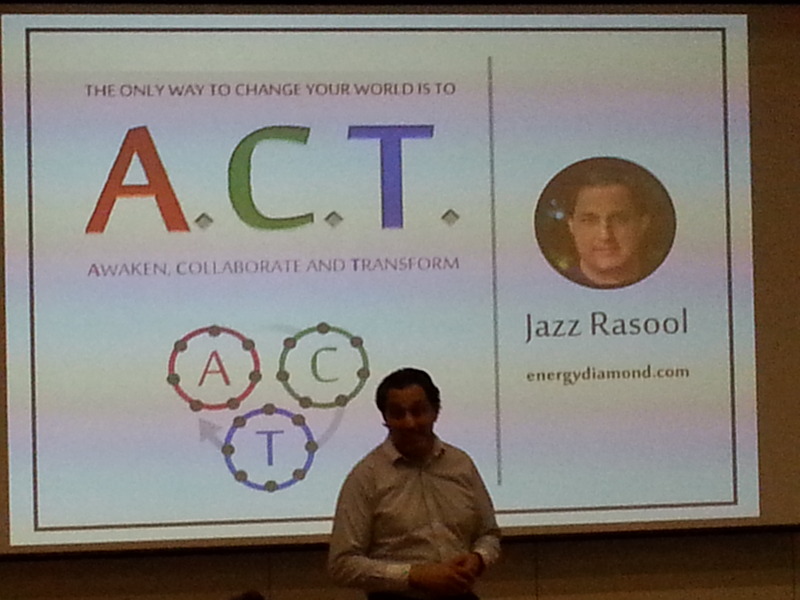 This talk was on “How can creative collaboration save the world?“. 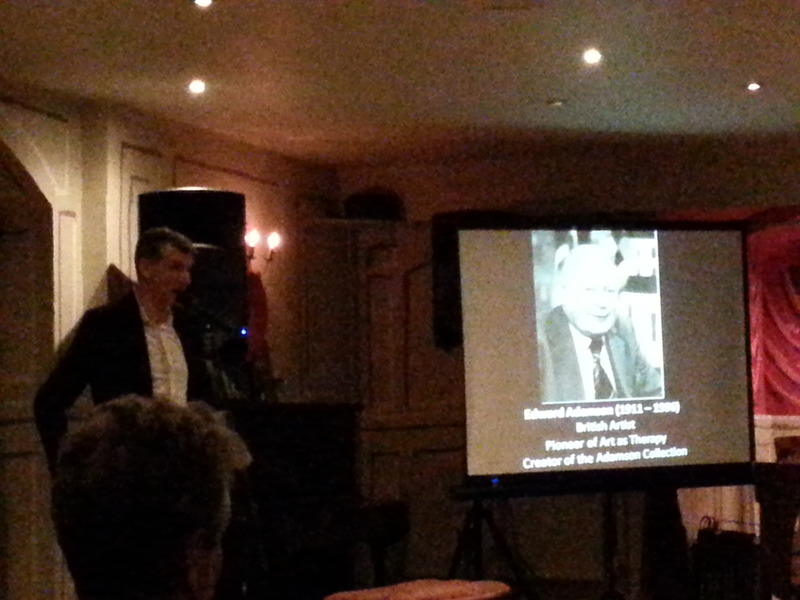 Now I don’t know if you managed to view my site post about the Edward Adamson Collection Talk on my blog, but feel free to visit the site for the link below. 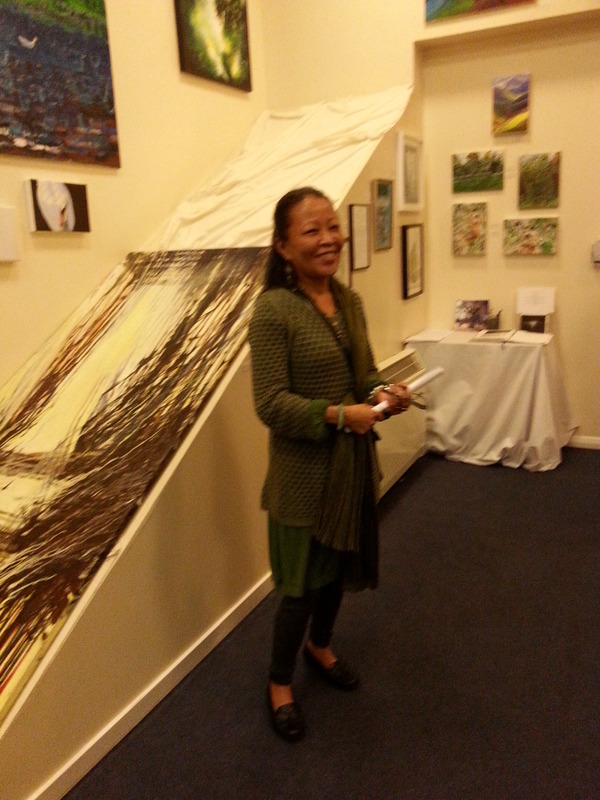 Going back to that talk I met a lovely artist by the name of Adele Orcajada at that talk done by Dr David O Flynn. 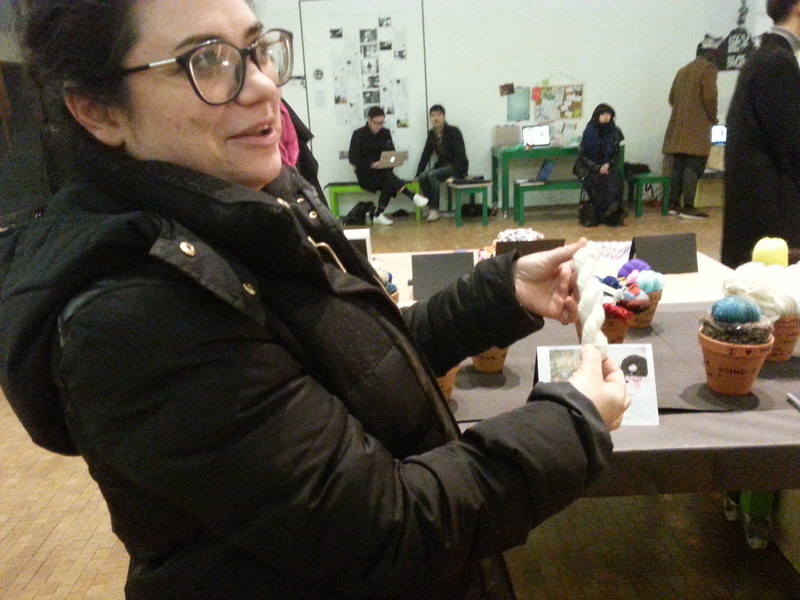 She told me about her project on the Masters Applied Imagination degree. Adele told me about her interest which was on Yarn, where Yarn is a soft fabric used for knitting. Adele told me her philosophy on the texture, colour and uses for yarn. I almost envied her passion for the fabric. So when she told me she was having an exhibition over at the University of the Arts London, I thought to myself it would be great to go over there and check her project out. Adele also reminded me that Dr David O Flynn was doing a talk at the PerPlexUs exhibition, so I felt it would be great to capture that as well, although unfortunately David could not attend that day due to an emergency. 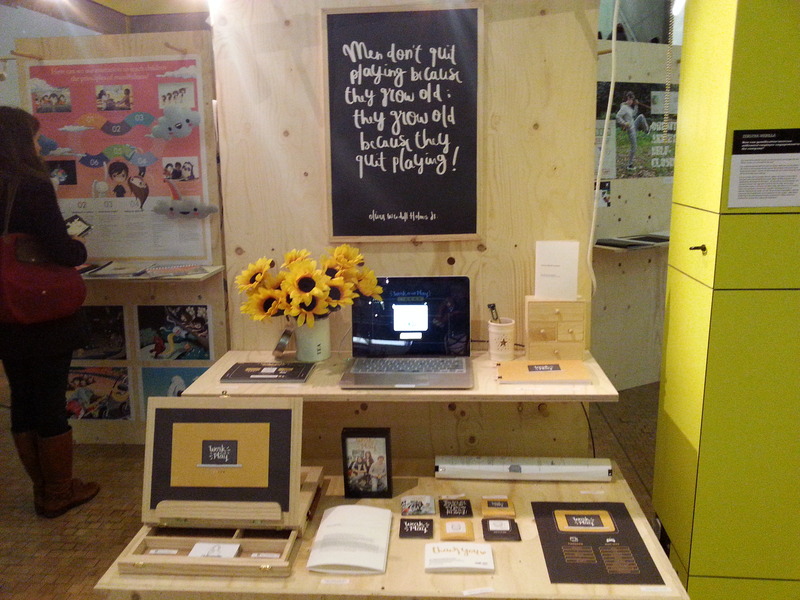 Now going back to the degree show, I felt the main emphasis of that show was how art could heal and help people recover and connect with each other. 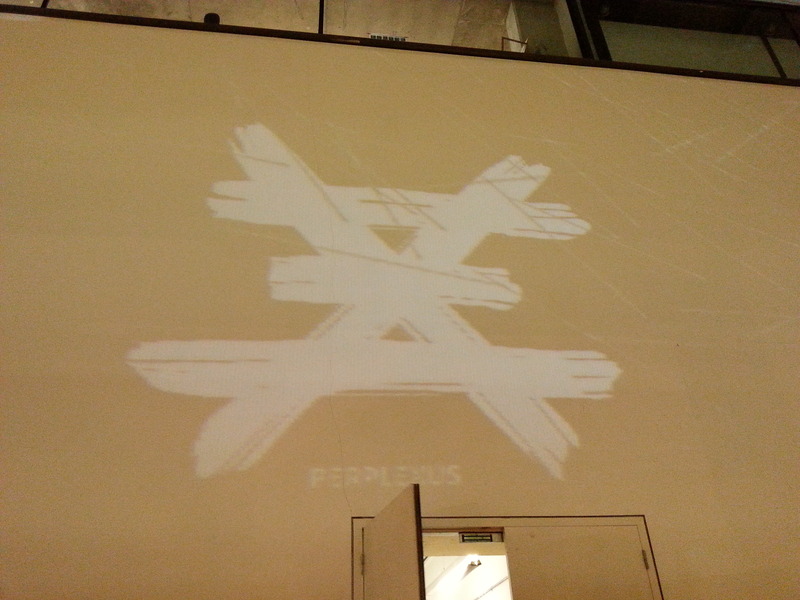 Still the PerPlexUs 2014 event also focuses on the students from the degree course raising projects to engage with many vital current issues and concerns from the personal to the global, being either gender issues, youth, well-being and so on. If you wish to see the video version of my review of this event, please press play on the video below. 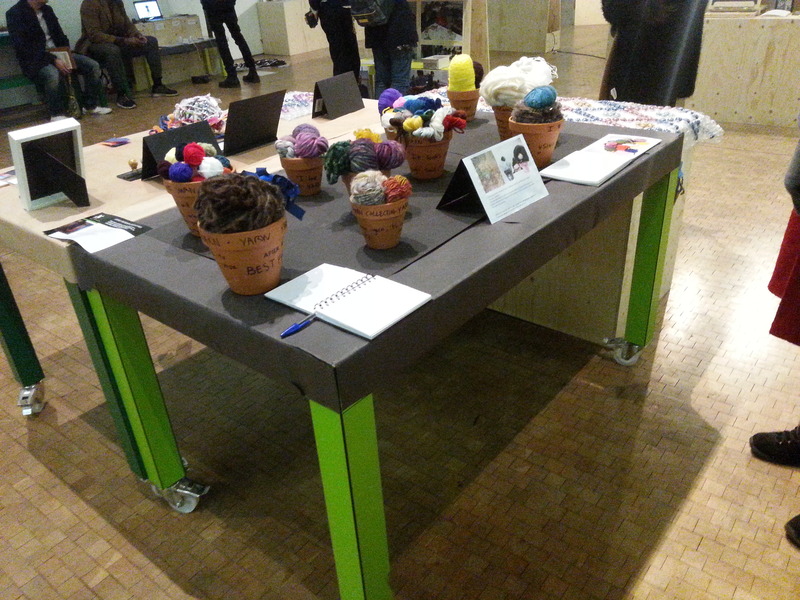 Adele then explained to me a number of her projects, one being story book about different types of Yarn. The other being a journal being turned into a ball of Yarn, plus Yarn rings which I thought were very interesting. I was also amazed at how the project aimed itself on dementia issues, where Adele took her Yarn for patients to use, although some would just touch the Yarn and felt at ease with it so they could sleep. Another thing that interested me at Adele’s project was the Yarn placed in bubble wrap, I was so tempted to press and pop the wrap, but thought I had better leave it alone. 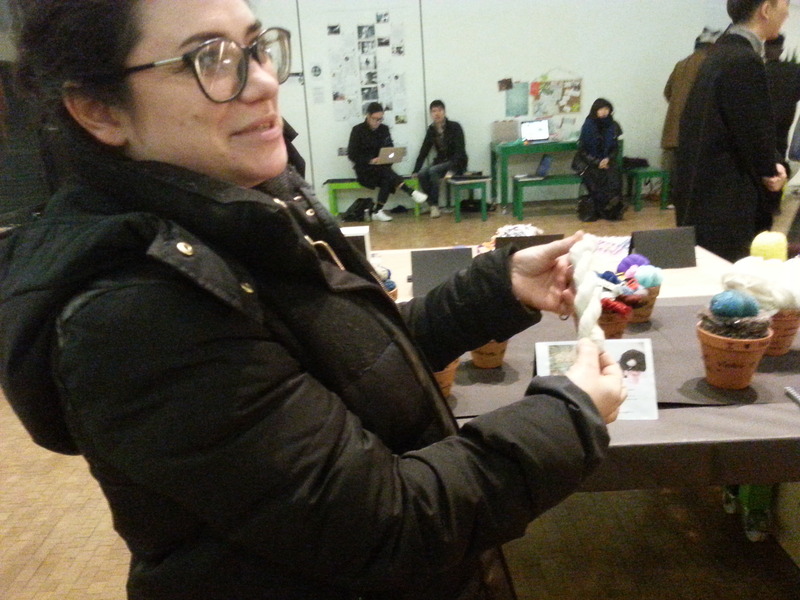 Adele showed me the types of Yarn at her exhibit section and explained further the properties and texture of Yarn, she also encouraged me to touch each Yarn fabric while she explained how it was nice to pull the string of yarn or make something out of the it. 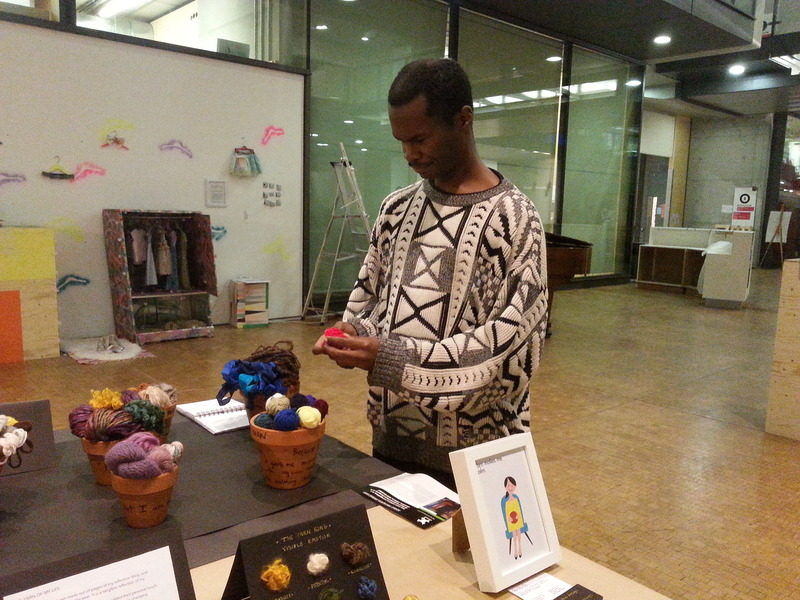 Unfortunately Adele was very busy that evening setting up much of the exhibition and also the talk on “Creative Collaboration”, so I took it upon myself to check out some more exhibits, I was hoping to hear more from Adele at the lecture theatre soon, before Adele rushed off, she invited me to touch and play with the Yarn some more and make my own thoughts about how the Yarn felt. I also took the chance to go through her lovely stories about the pots of Yarn on her stall. 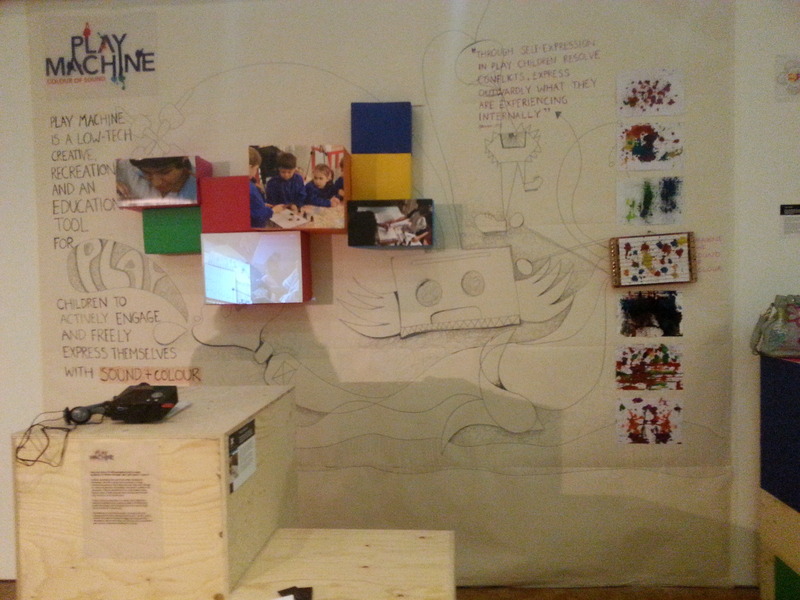 Here is a small explanation from Ritika herself, basically “Play Machine” is a low-tech creative, recreational and educational tool, which combines both sound and colour, giving children the opportunity to freely express themselves. One of things that struck at the Play Machine Exhibit was the messages on the wall. I also took note of how the pattern’s of paint were painted on paper up along the wall as if it was done playfully, but also being rather attractive to watch. 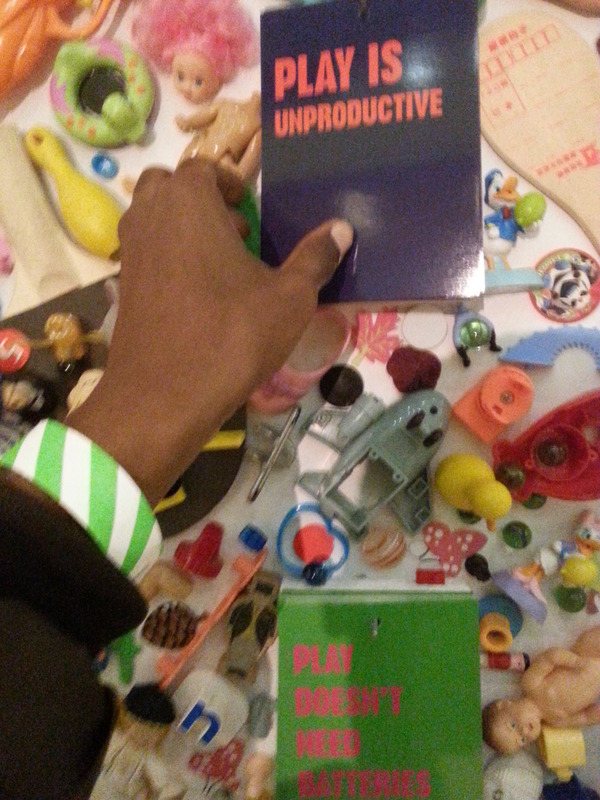 I decided to also take a memento of the exhibit took a card on how I felt play was actually unproductive in a good way. 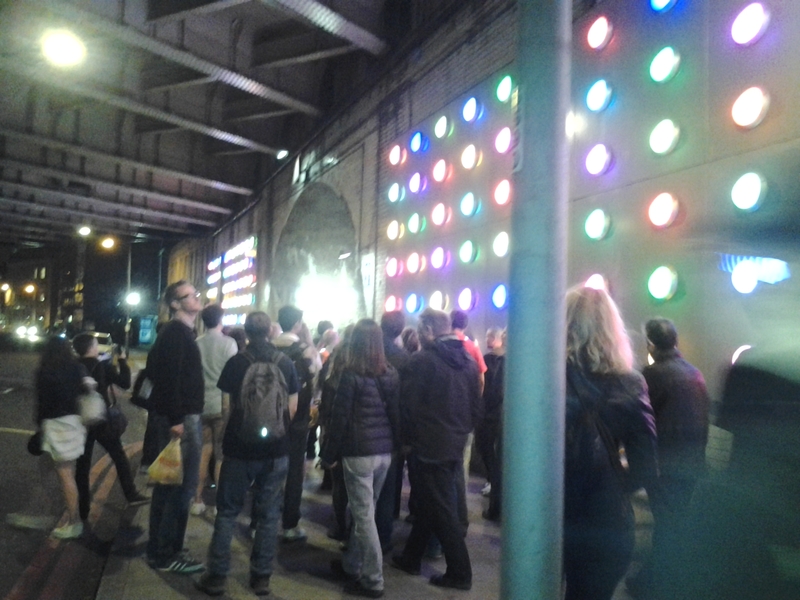 One of the installations I stopped at before I got to Adele’s exhibit was one done by Mitchell Cutmore. 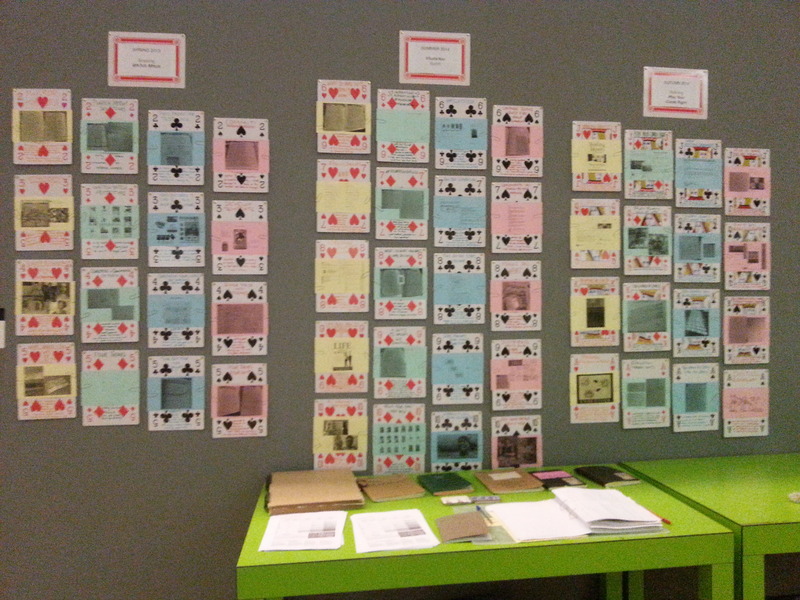 His project was on “How can playing with personality help you play your cards right?” I was wondering why a large number of cards were placed on the wall. This was rather perplexing, but when I approached to find out more information, the project explained that this was a grounding metaphor to help people know themselves better by playing card games to boost self-awareness. Here people can shuffle, split and personalize their personality and it is suggested the card game “Rummy” to do such a task. I then turned to check out a large section of exhibits in the middle of the hall and I was drawn to an exhibit nearly laid out. Well this reminds me of Google, since I tend to feel they aim to merge work as if the employee was playing. Zerlyna emphasis on this section is How that Work as we Play, is an internet-based system wrapped in a ribbon of fun for employers to engage their employees. I did not spend too long at this exhibit, but being an IT person, I did attempt to create a character off the laptop placed on the stall. I moved on to an interesting section that looked to be called “Sound Hanger”, this one was done by Kwan Hee Cho. 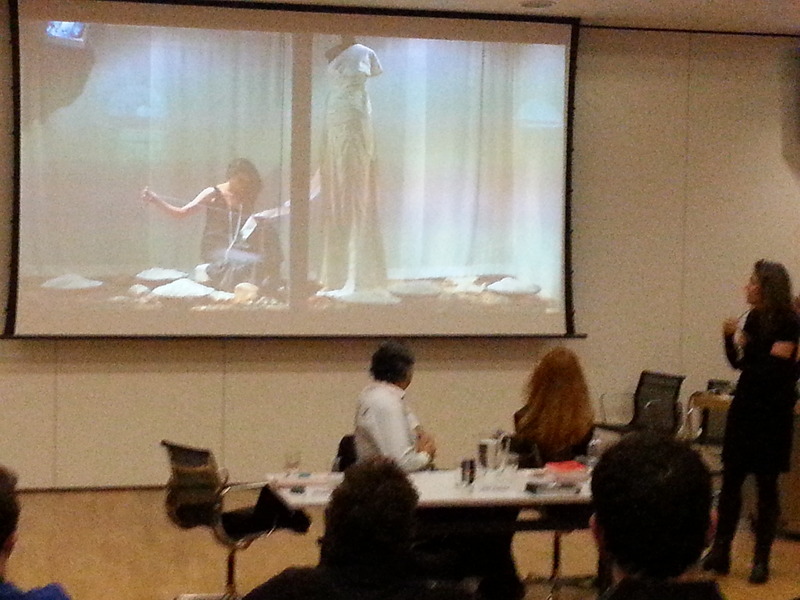 Her project was on “How can multi-sensory tagging enhance the shopping experience for the visually impaired?“. Here it is mentioned that when the blind pick out clothes, they know basic information about material and shape of clothes by using the sense of touch. 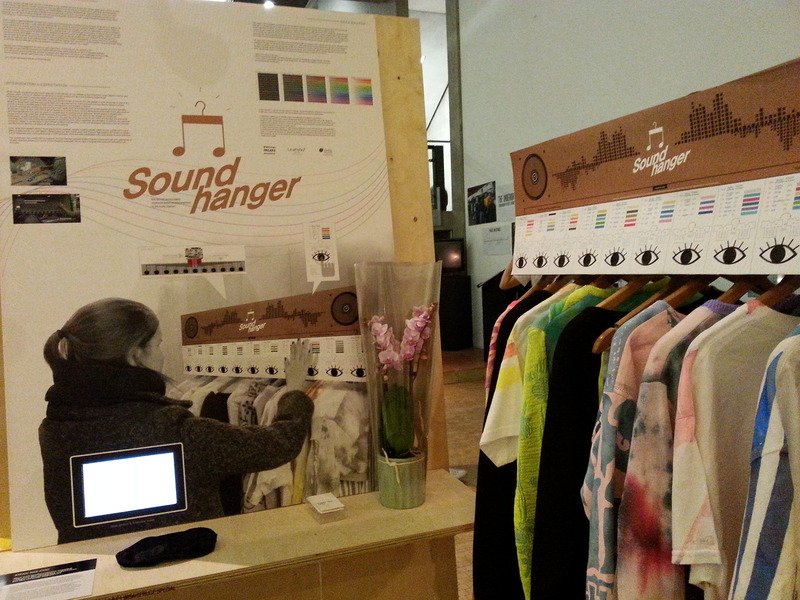 Here this project provides a new shopping experience through hearing, transferring colours of clothes into sound, plus giving experience to sighted shoppers. I felt this was a fairly interesting project, which looked at how London is a global centre of production for screen industry, but Dongran noticed it was a good time for the Chinese film market to help develop fresh ideas. Here this interesting project looked at blending the two elements of online and physical environments together, where art does not just exist on the internet. I felt the project was attractive and nicely laid out. As I looked around the large hall, I kept noticing this sign placed around the place. It looked to be tribal or almost some far eastern symbol. I wished I had asked someone what it was or what it stood for, the symbol was certainly perplexing. Ok, ok….that was a long project title, but I guess there are quite a few around. So what does this polymeric islands mean? Well I read that this project is concerned with individual action and aims to show that action DOES count. In fact, it proposes that this is the only way in which change can come about, where one person changing one small part of their world, again and again……I like that. 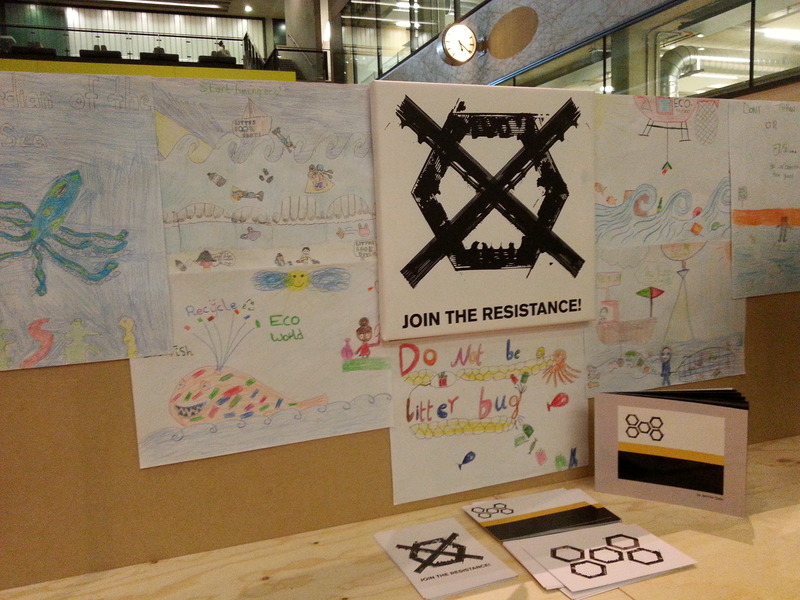 The project looks to attack the problem of consumerism and our ecological myopia. 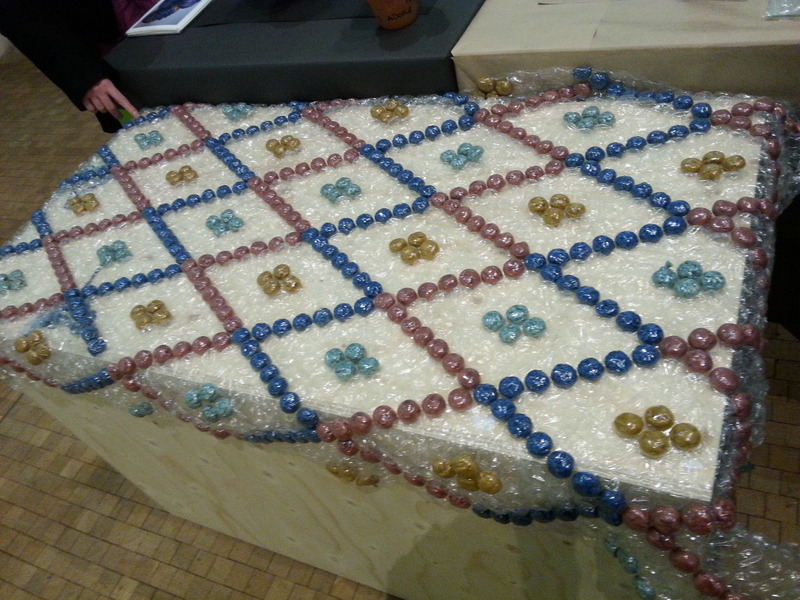 I spent quite a while looking at the Polymeric Landmark placed near the exhibition. The next installation was done by Kibi Schultz. 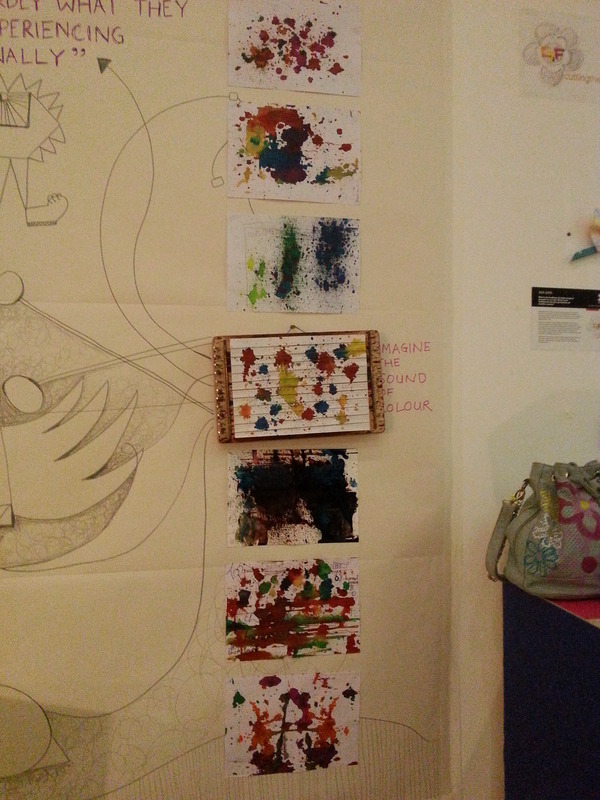 I was really impressed by the use of space and colour and the closer I got to the display, the more I saw the message about the exploitation about female children’s bodies, this being on the topic of Female Genital mutilation and the pressure to change their bodies. 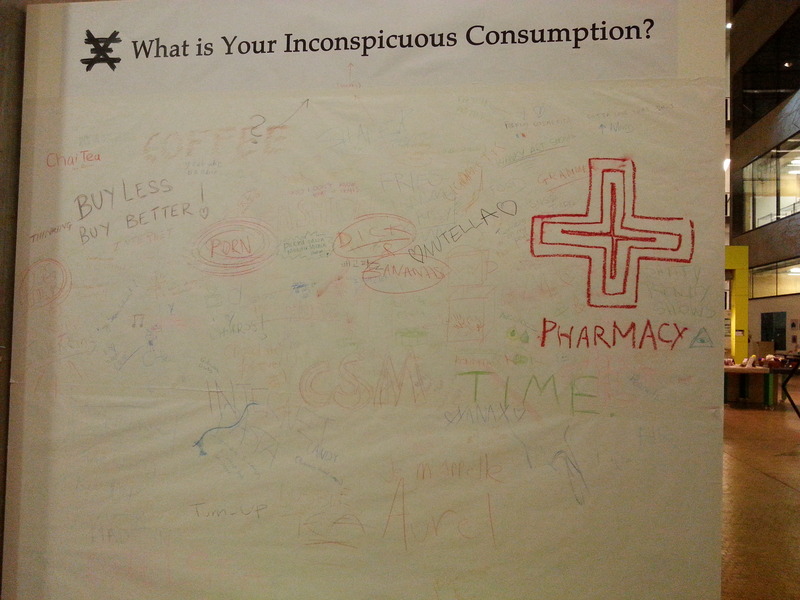 A few steps away was another exhibit, visitors to the exhibit were asked “What is your inconspicuous Consumption?“. Going back to the large sheet of paper on the wall, I did not really know what my inconspicuous consumption is or was. So I just noted that I agreed with someone else’s view. Here this project asked if people ever considered consulting a psychologist and looked at the stigma and embarrassment of those who were too afraid to admit this. Here this exhibition has a blog to help raise the awareness of mental health and I glad to see an exhibition whose core aim was mental wellbeing, the project also has a blog, which I not managed to get hold of as yet. What impressed me at one of the last installations I visited was how engaging Belinda Shi was about her work. 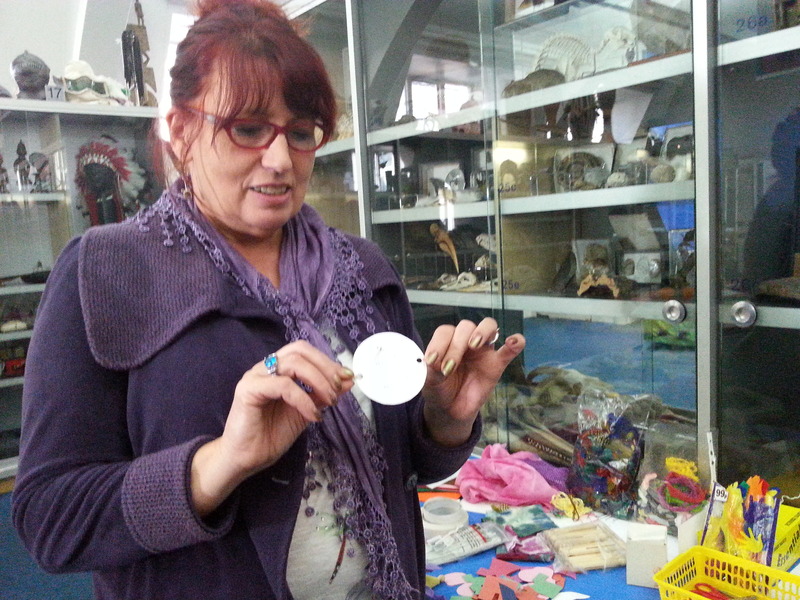 Belinda took the time to explain what her exhibit, which allowed people to tear off or cut off the paper on the wall to reveal cards on Chinese art. 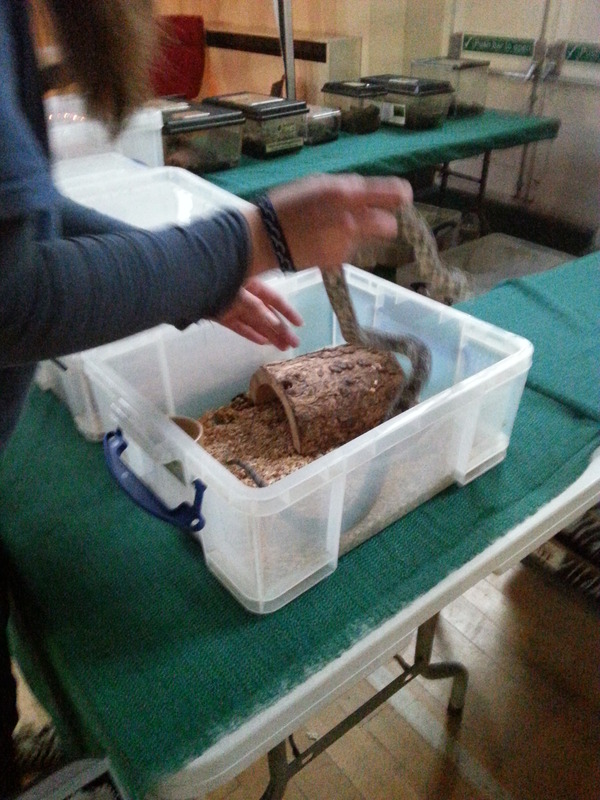 You can find out a bit more on Belinda’s work off her facebook page. Next to Belinda’s work was Yinghui Cao’s project looking at “Cutting the sleeve – How can Chinese gay men be encouraged to refuse sham marriages?”. There was a video of a young Chinese man cutting off some clothes from what I believe is an ancient Chinese story was mesmerising. The project is a campaign to encourage Chinese gay men to be honest with their sexuality and refuse to get married to straight women in sham marriages. This perhaps might be the situation in China, where pressure is placed on many to marry, but I guess the same can be in the west on some circumstances. We had several hosts at the talk, who were so happy to see people coming together and being creative and where there are ways making people think in a new light. The thing is that socialising can be a creative process and bring a community connection. We also got to hear from 2 other artists. 5. Inconspicuous consumption – old clothes to new clothes innovative. 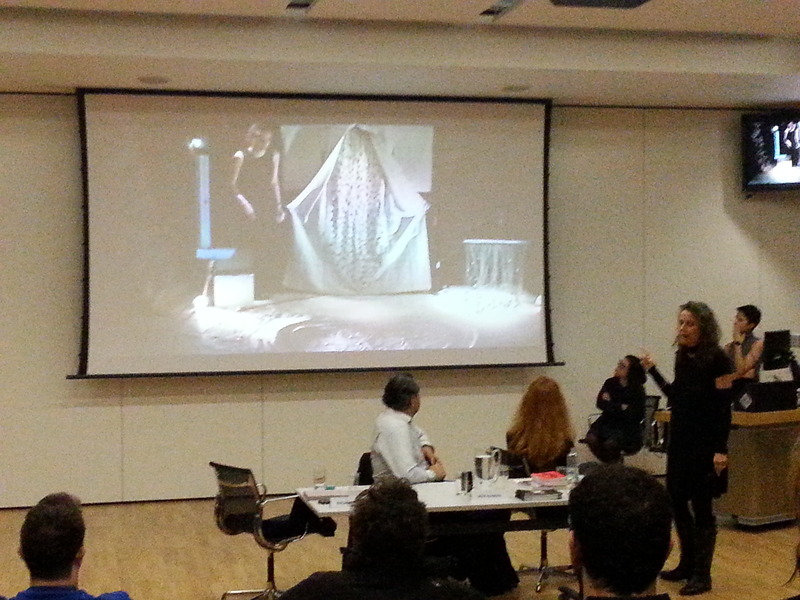 Next we heard from the 3 artists at the panel who two I have briefly mentioned already. Now Regina talked about on one project where she Worked on an art piece for 28 days to emulate the workers on slave wage. E.g. developing country workers. She talked about how she has travelled around the world while using the internet as digital information and found words that she felt she had some connection to. Went to Atlanta to make an art on a game where no one wins, felt amazing experience of people contributing on poetry. One project was on a Mushroom dress where mushrooms were grown on a dress and shared with others. An interest project using sound where she used Cracking out from a mould and also used the sound of cracking the fruit open and painting with it, the sound was an amazing experience for Regina. Who told us of the experience she had when trying to explain to a big company about a piece of art work, but it showed how difficult it is to make an art piece. The problem was on how nobody understood her about how hard art is to make. Something was wrong. 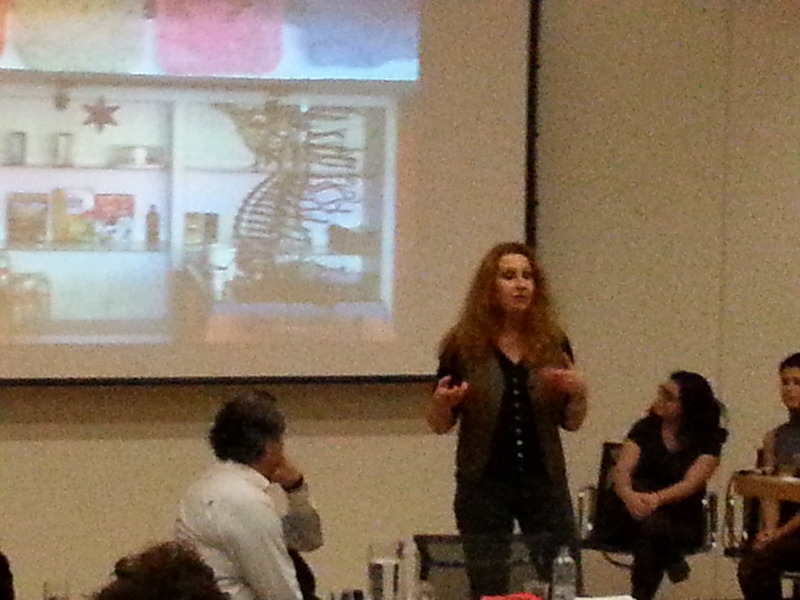 Now Maria wants to be part of the world, no more artist language, she felt she spent too long with other artists. Her mission was not to be so private, but take her art studio out into the world. Into museums. Her Studio was also taken into a hospice, and although as we know people die there, the project was challenging on how art would be taken to a place like that, but maria was nervous about the interest. Maria found out she was in dialogue with other people, she noticed art can HEAL. Maria also painted sea horses near business, which helped a business because people wanted to have their picture taken by the seahorse. 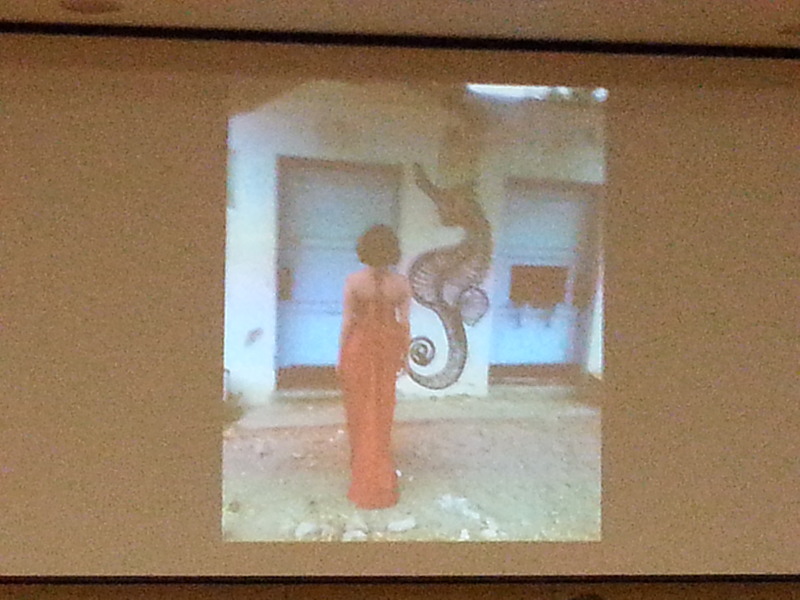 Seahorses painted around the world, seems to be connecting people and she has made film “sea horse symphony. Here on this model, it is a Working wheel, where each Spends time in each cycle, but relies on it to build up momentum. In order to be creative, have intent, cook it, transform it. 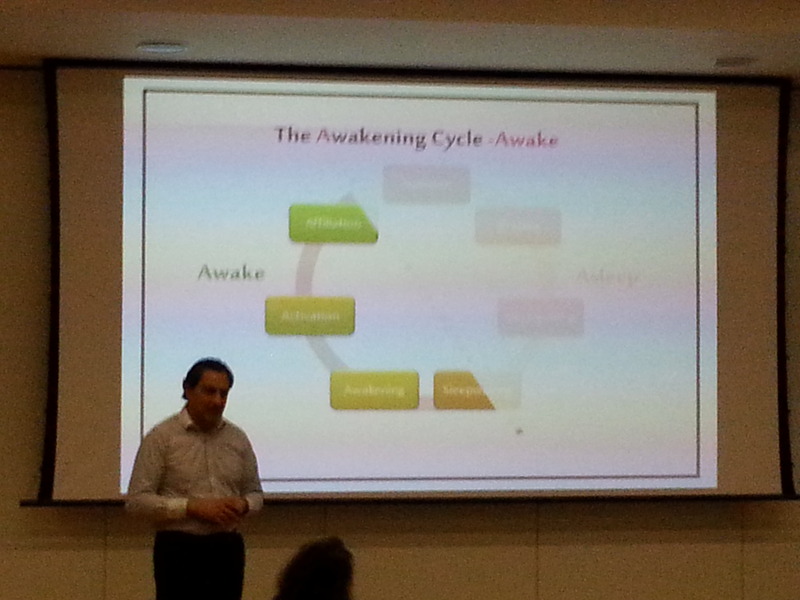 Explains a bit on Awakening cycle, connecting better with yourself and the world around you. Half of the cycle is about waking up. 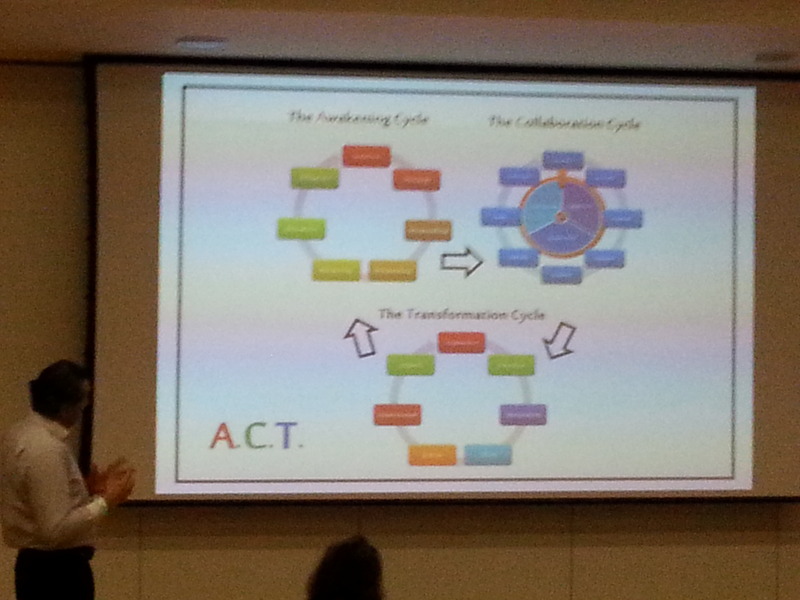 He the moved on to the collaboration cycle, where he explained on the use of committing to collaborate with others, half the cycle is cooperation and building of trust of people. Need commitment, but can lead to bigger things as influence the world as a whole in itself. Jazz warned on avoiding the competitive cycle, this is where you go in reverse, which is backwards, the thing is we need to contribute. The last cycle was the Transformation cycle, but half the cycle is planning, but after a while this turns into action, and if this is done well it can lead to impacts and that is done really well it can lead to another spin of the cycle. After the talk, I actually got involved in the event with the students where we participated in several group workshops. 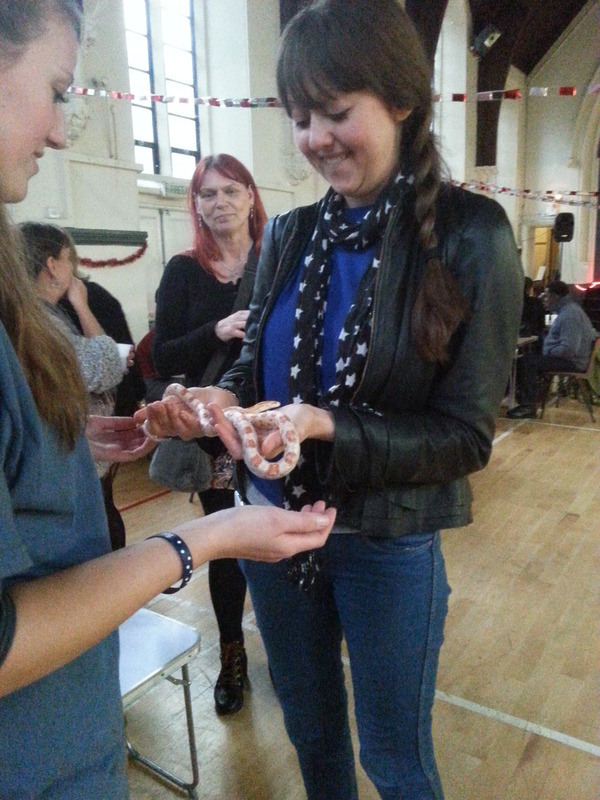 One was writing a word or phrase that can relate to the community in which we are drawn to. We then used the words or phrases of other artists to make a story. We then moved on to learning about our abilities and talents and learning about other people’s talents who are opposite from us, but also opens up room for learning from our weakness. 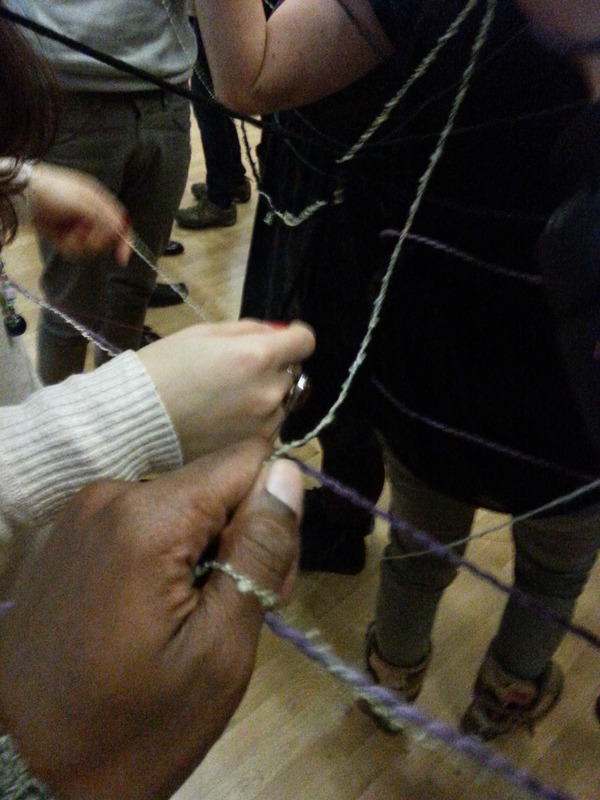 The last section was connecting with each other through A web of Yarn, each with a different colour, texture and length. Overall I enjoyed the event and to be honest this was the students final projects before they graduated and I wish them well with their future projects on pushing the boundaries of art, using art to make a statement or activism, help raise awareness with art and most importantly experiencing creativity in their lives where art helps them in their journey. 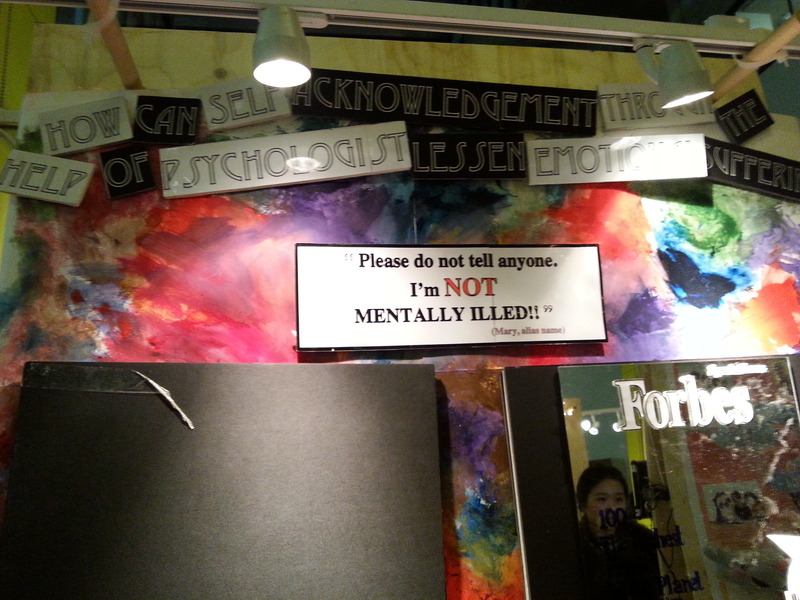 This entry was posted in Event reviews and tagged art, art exhibition, community, mental health on December 14, 2014 by mmckenz11. 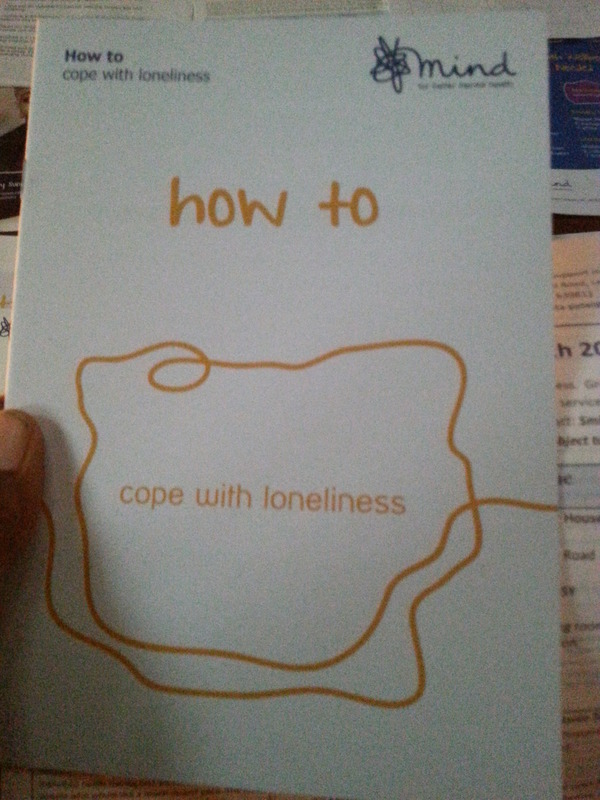 Welcome to another blog on caring on mental health. On this blog post, I want to talk about an art exhibition I went to check out over at the SHARP gallery located in Brixton on Brixton road. 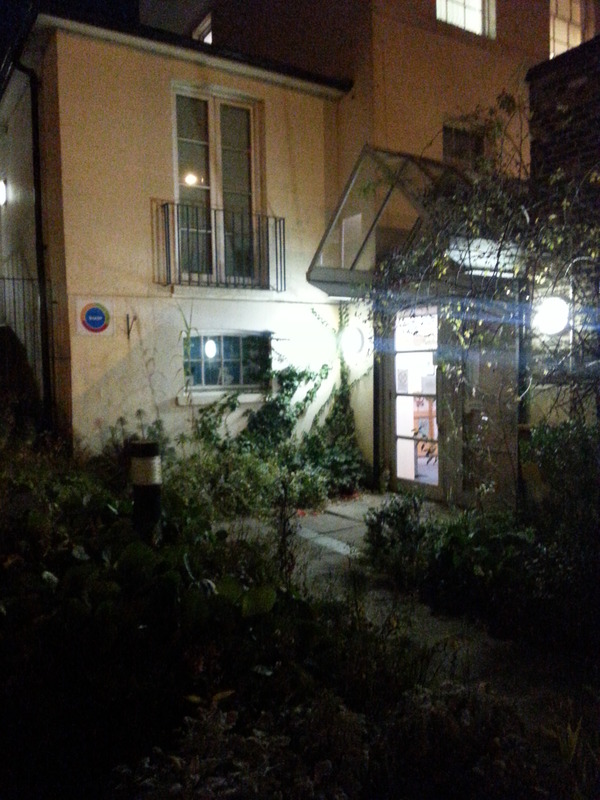 The private viewing was on the 10th of December 2014. Now SHARP stands for Social Inclusion, Hope and Recovery Project. Basically SHARP is a specialist team of mental health professionals focussing on recovery and wellbeing for people accessing the mental health services in Lambeth. The team is made up of Occupational Therapists and Psychologists and they help provide group and one to one interventions, helping people develop their mind and body and offer types of therapy. A bit about the SHARP galley. Now the SHARP galley was set up in 2012 by local artist and carer Mary Salome. 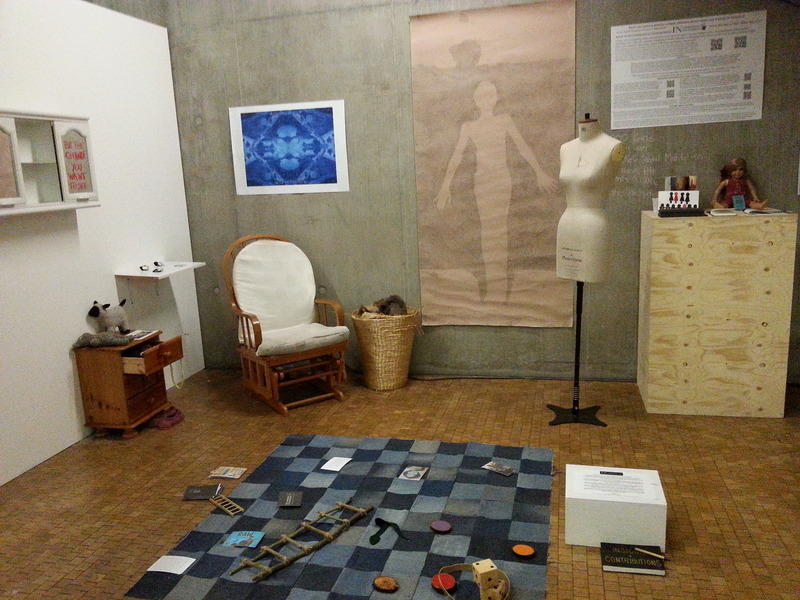 The galley has exhibited the work of over 70 artists and many of whom use the mental health services. The gallery aims to be inclusive to all with no selection panels or screening of artists. 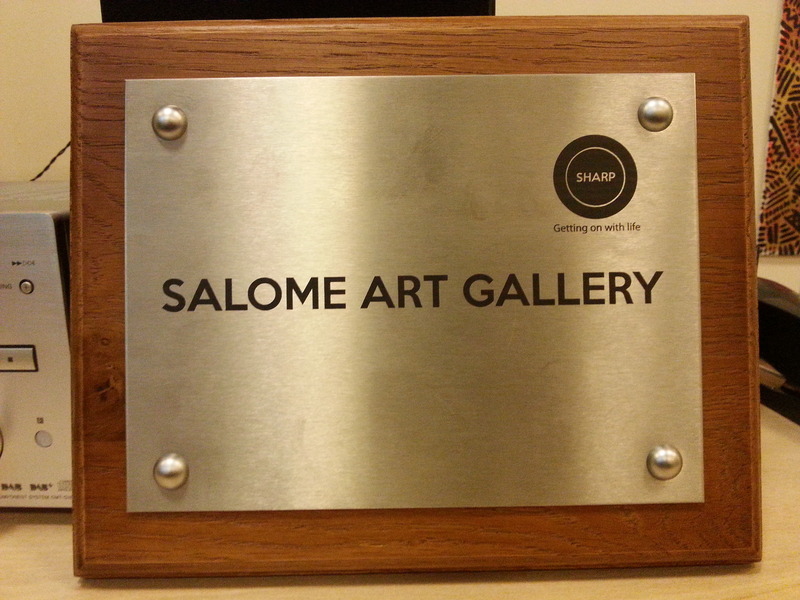 Eventually the SHARP gallery will become the Salome gallary by the end of 2014. Well what was this art exhibition about? 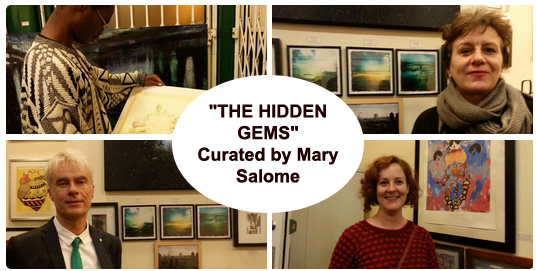 The show was called “Hidden Gems”, and it is a celebration of staff art within South London and Maudsley NHS foundation trust or SLaM for short. South London and Maudsley NHS Foundation Trust provides the widest range of NHS mental health services in the UK. Although I have done a written blog post of the event, I have also done a video blog as well with narration. 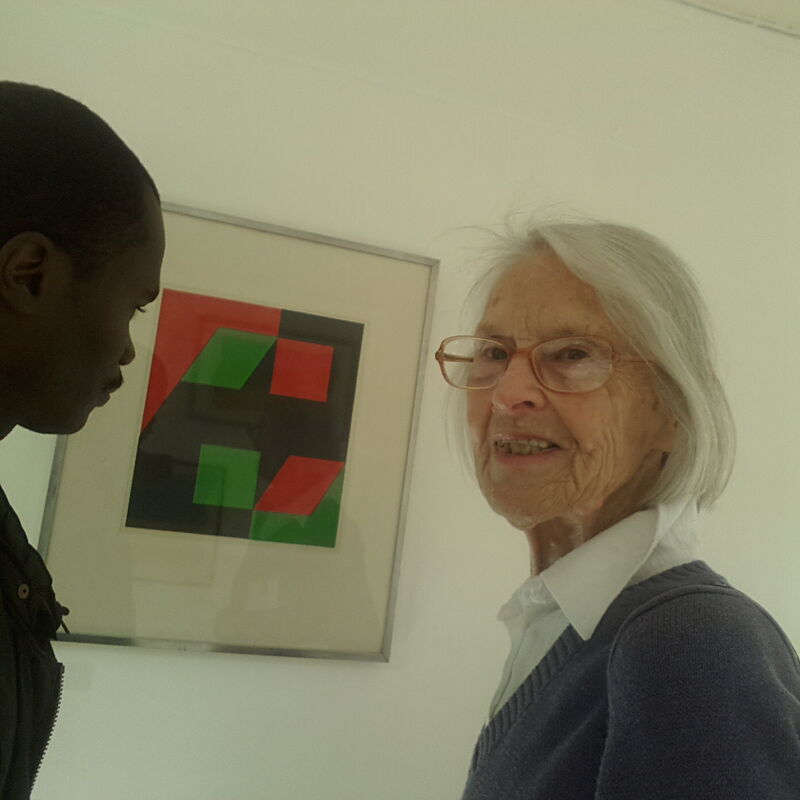 Going back to the exhibition, I managed to chat to Anna Croucher about what to expect at the exhibition and I also chatted to Sarah Josefsberg who is an Occupational Therapist. Sarah had some interesting views about why people paint and how she felt art is a way to break away from the label of mental health stigma. The first SLaM staff and artist I spoke to was Dr Richard Corrigall is a Consultant Psychiatrist at Snowsfields Adolescent Unit. He is Chair of Trust’s Local Negotiating Committee and CAMHS lead for medical student teaching. Here Richard showed me his work called “Escape”, which was inspired by hearing a story from someone using the services, although he has recently got back into art, he felt the story from the service user was so inspiring that he visited her site and that got him into paint. His “Escape” painting looks into recovering from Mental ill health, but is also a form of kaleidoscope and playing around. 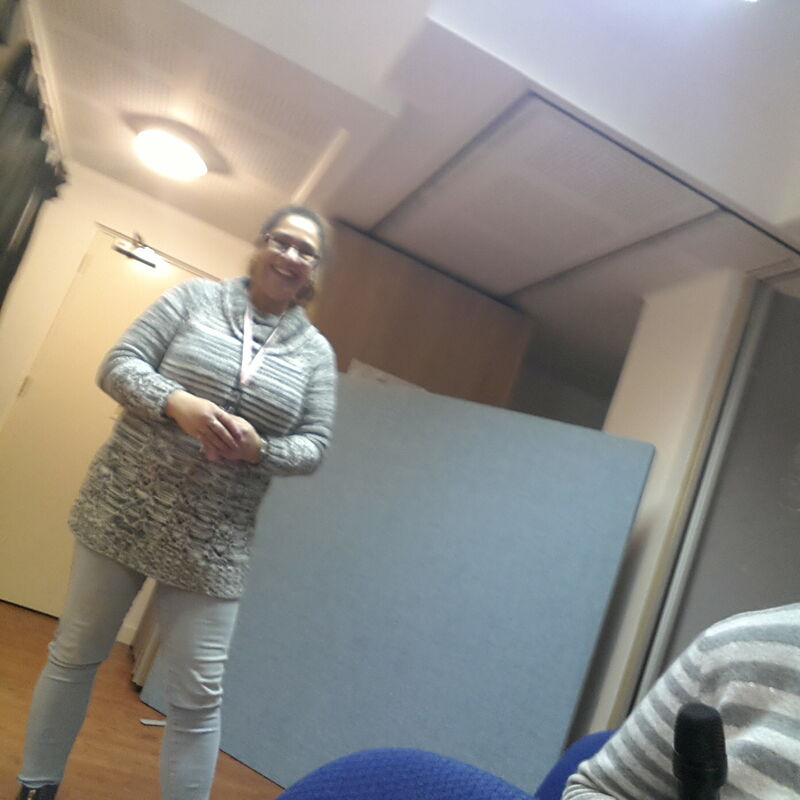 Next I spoke to Carol burtt who is a psychologist for the IAPTs team in Lewisham. IAPTs stands for Increasing Access TO Psychological Therapies. Now Carol showed me two very large paintings. These paintings were untitled, but abstract in showing some form of a railway track. Interestingly the two paintings were meant to be formed together, but Carol mentioned to me that it is up to the viewer to relate to what they feel about the paintings. 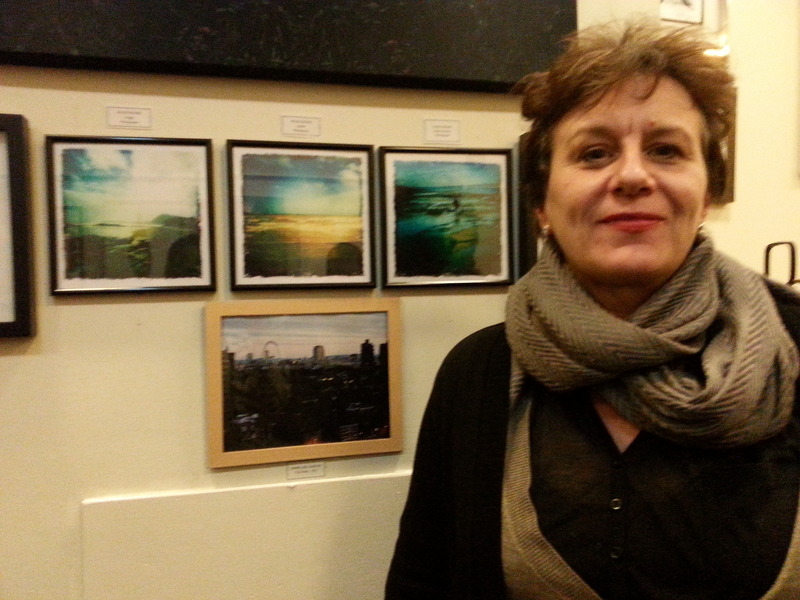 The next SLaM artist I spoke to was Jill Abrahart who is an IAPTs employment worker. Jill helps and engages those who try to find work. 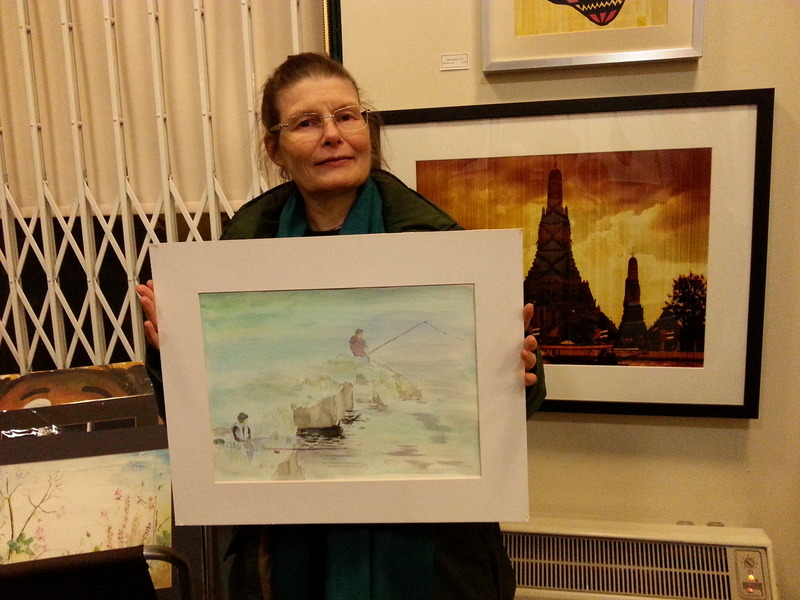 Her painting was when she was on holiday in Rhodes and she managed to capture and paint the sunrise. Jill also showed me 3 other pieces of her work. One of them was called “lavender” and the other being “view from a window”. Again Jill was on holiday, but she was playing around and experimenting with paint. One of her other pieces of work was when she was going through a difficult time, the painting was called “Preparation for Separation”. Basically she painted through her expression and her the painting is a moody blue filled with splashes of different colours. 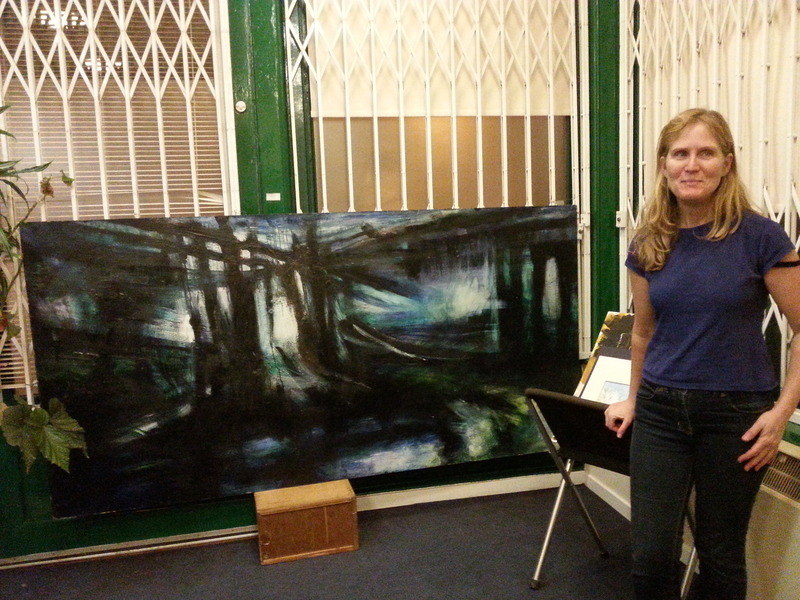 I then talked to Alex Harwood who is an Arts Facilitator. 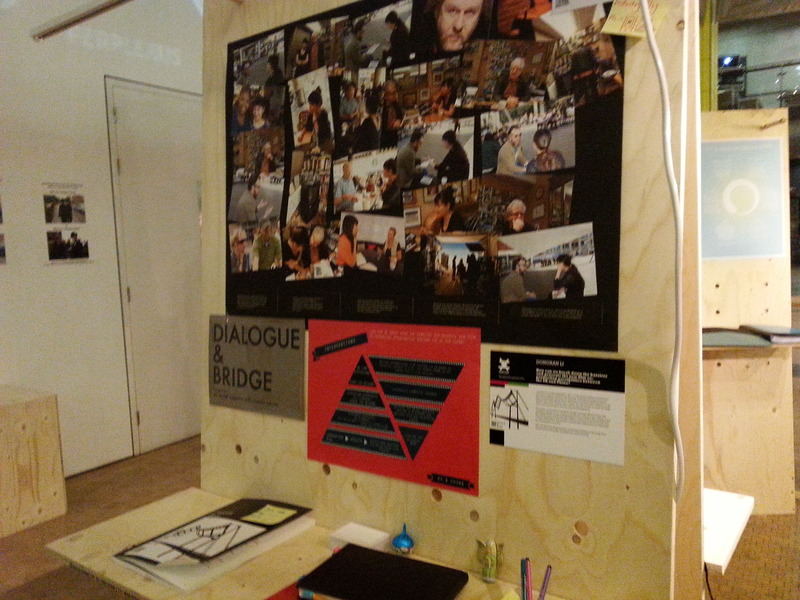 He facilitates two groups one being the Blackfriars CDAT group and the other being the SLaM ADart group. He has been on the art scene for around about 1 year and has done work at the Institute of psychiatry Psychology and Neuroscience. The first piece he showed me was a mixed media painting called “what a way to make a living”. The painting which was one of my favourites at the show, was about how travelled into work years ago and parts of the painting is on the tools he used for work all those years ago. Alex then showed me another photograph picture, which was one of his art work. Here Alex is trying to capture real life. After chatting and having some refreshments. 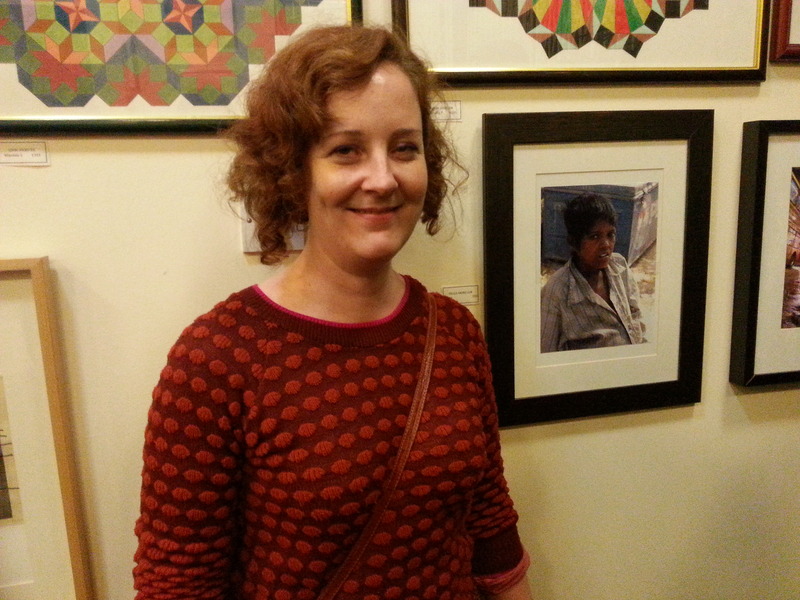 I then spoke to Paula Mochair who is part of the STEPs team working on STEP art. Paula showed me her photograph art work on the homelessness in India and she showed me the mixed media painting which was inspired by her 3 legged cat who liked to stash ripped up papers in his litter. I then chatted to Terence Wilde about his 3 colourful paintings, but unfortunately none of his mental health work was on show that event. 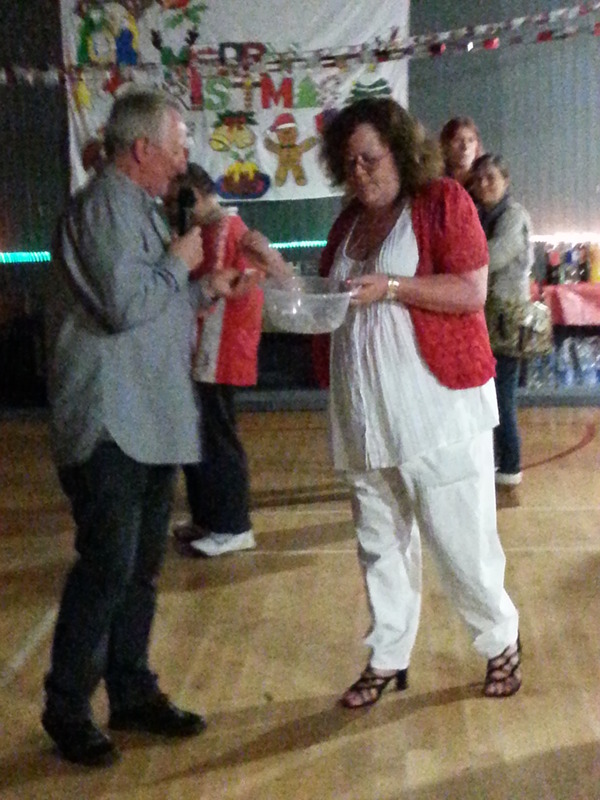 Next was Carol Stevenson who is the membership officer for SLaM. 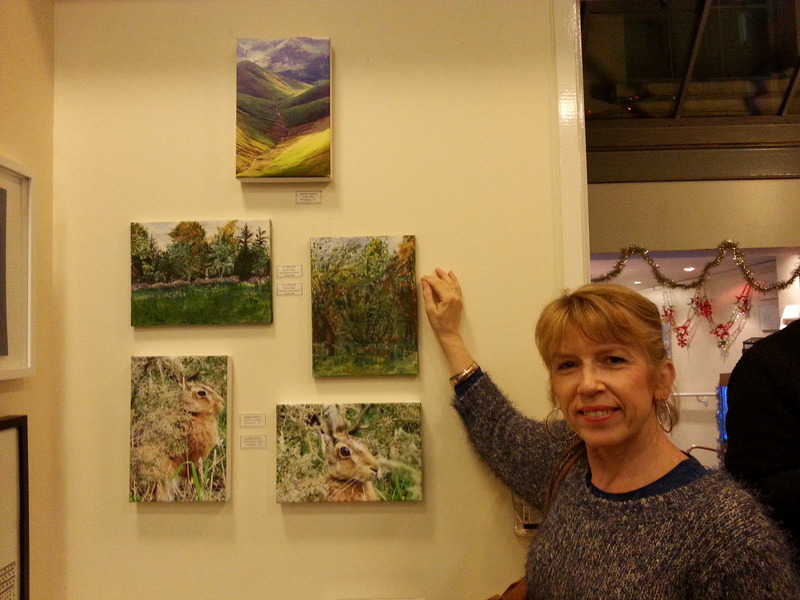 Carol showed me 3 of her paintings, one titled “In the undergrowth” and the other called “fishermen” where she managed to paint some fishermen while on holiday painting some waterfalls. Her paintings were based on experimenting with shapes and colours. 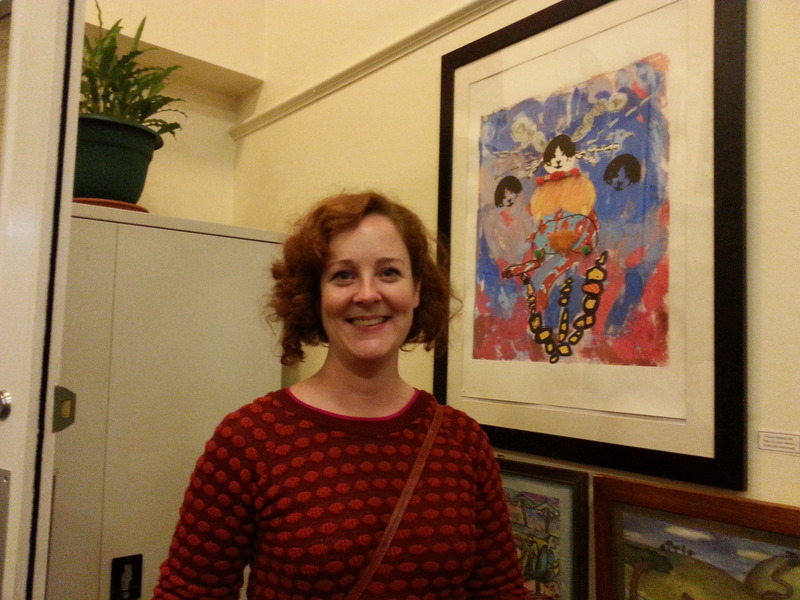 The last artist I spoke to was Helen Shearn who is the Head of Arts Strategy for the Mental Health trust. Helen spoke about her photograph paintings she did some time ago. 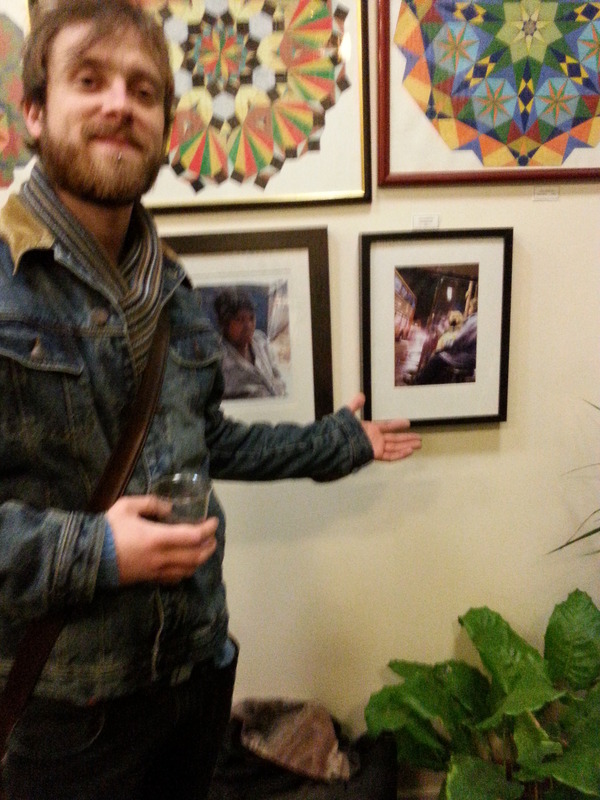 Well overall I enjoyed attended the art show and talking to the various artists. I was really surprised at how many SLaM staff were creative in their art work. 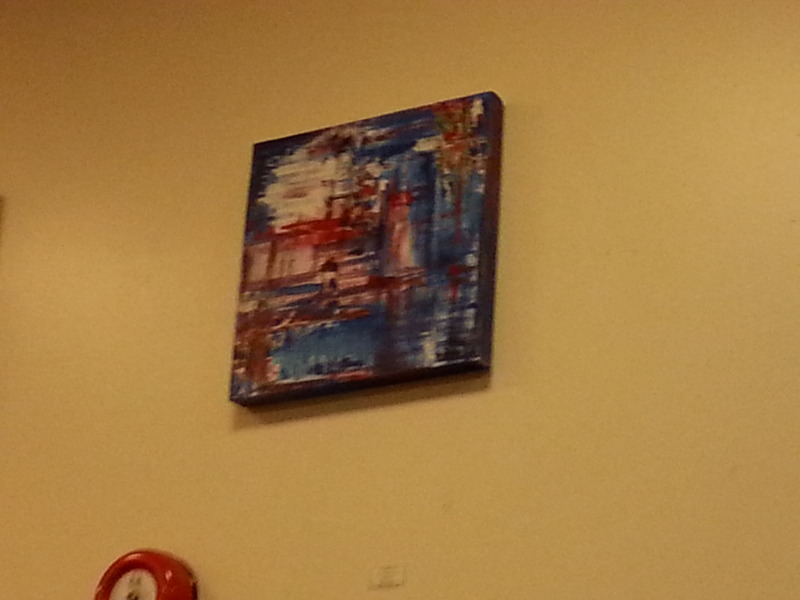 It was great how they supported how art can help others and had the time to even put their art on display. It was a shame I could not capture all the artists at the exhibition, but hopefully I ll get around to it at some other art show, who knows? I thank Mary and her team on being so helpful for allowing me to help blog the event and I thank Helen Shearn and the other artists for taking the time to explain their artwork. 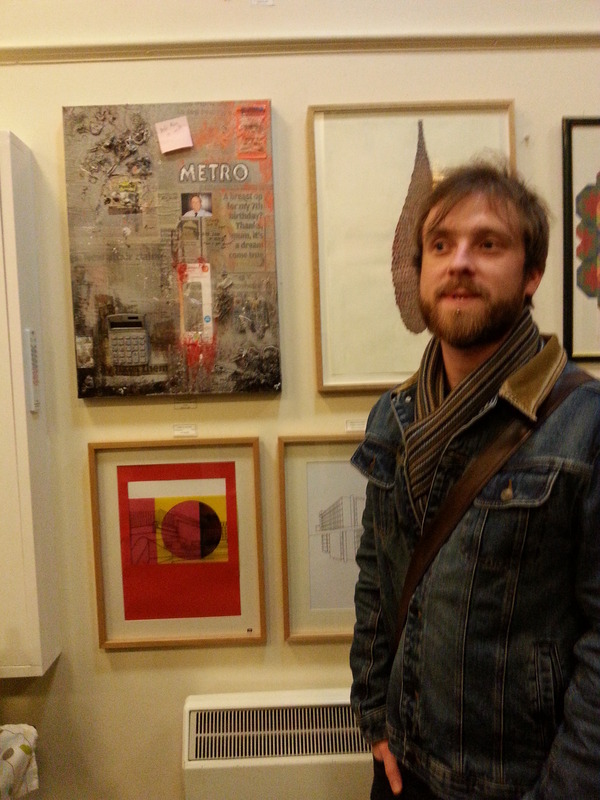 This entry was posted in Event reviews and tagged art, art exhibition, Brixton, mental health, SHARP gallery on December 11, 2014 by mmckenz11. Welcome to another blog post from a carer who is caring for a close relative using the mental health services. 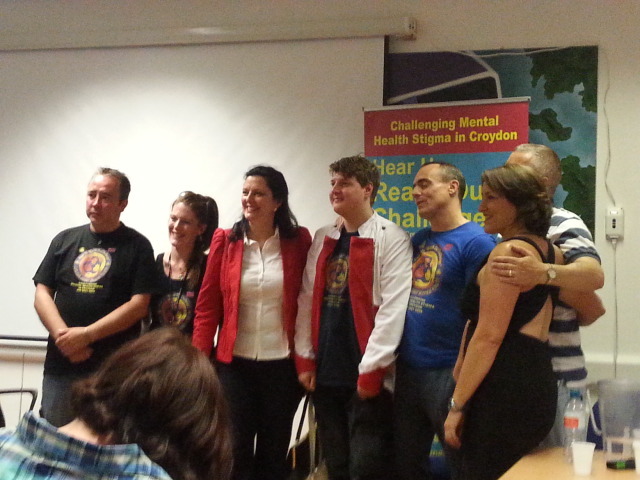 This particular blog post is about a mental health forum over in Croydon, which is free to attend as service user, carer or even mental health professionals. This mental health forum is called the ‘Hear Us Open Forum, but what is Hear Us all about? To relieve the needs of people living in the London Borough of Croydon and surrounding areas who have mental health problems by provision of services and advice. 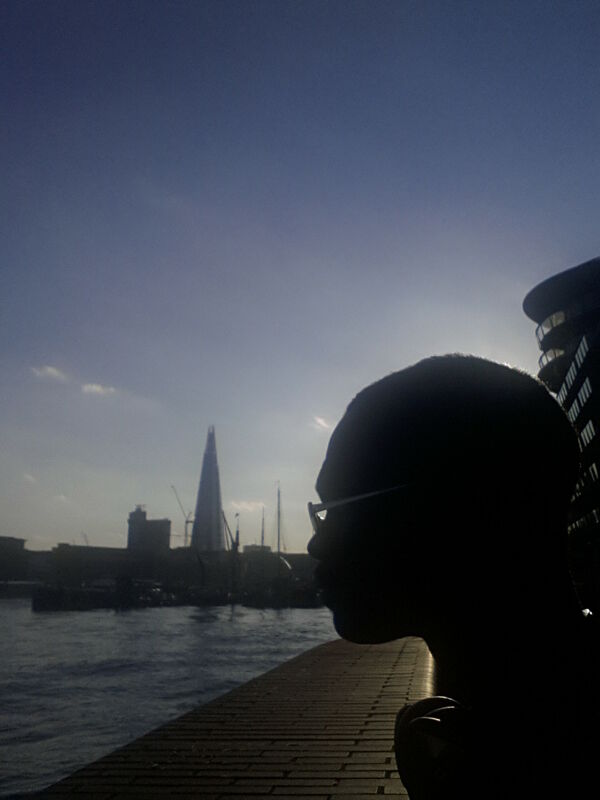 To advance education about mental health for the public benefit in the London borough of Croydon and surrounding areas with the object of creating awareness and reducing the stigma attached to mental health. Now Hear Us run their open forum every 2nd Tuesday of each month. Unfortunately I have been so busy that I have missed 2 of their past open forums, but this time I was determined to catch their December forum and I was not disappointed. 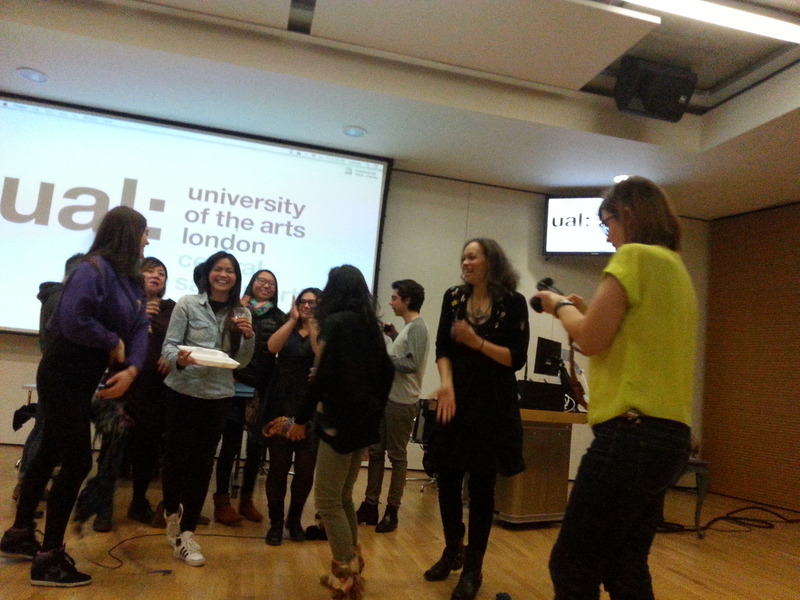 So what was in store for us at the December Hear Us forum? 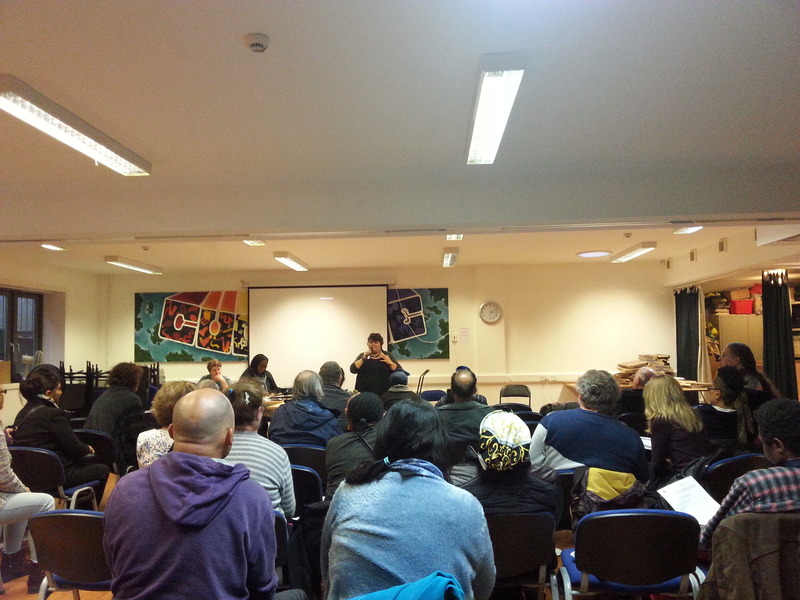 Well first we got to hear about the latest Hear Us AGM. 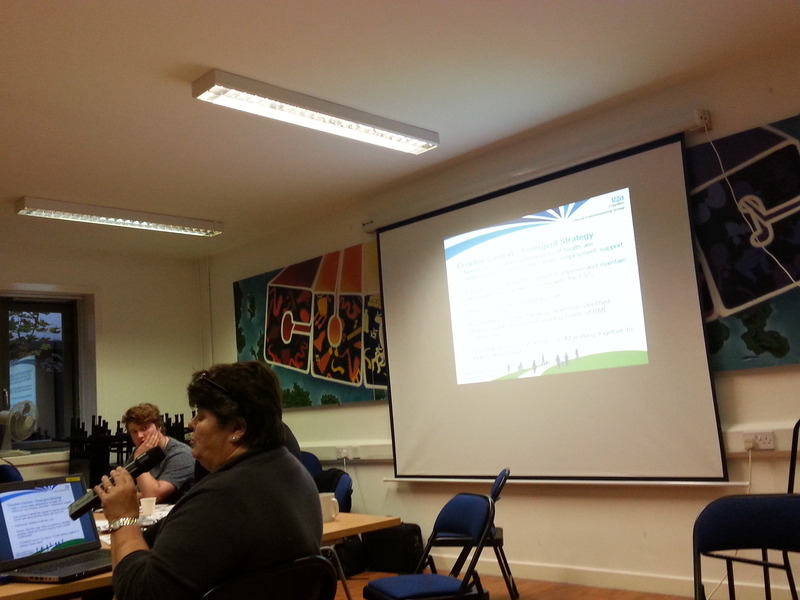 Plus last but not least was the Mental Health Strategy from Susan Grose one of the Croydon CCG Commissioners. First we had a lovely hot lunch for the cold December day. 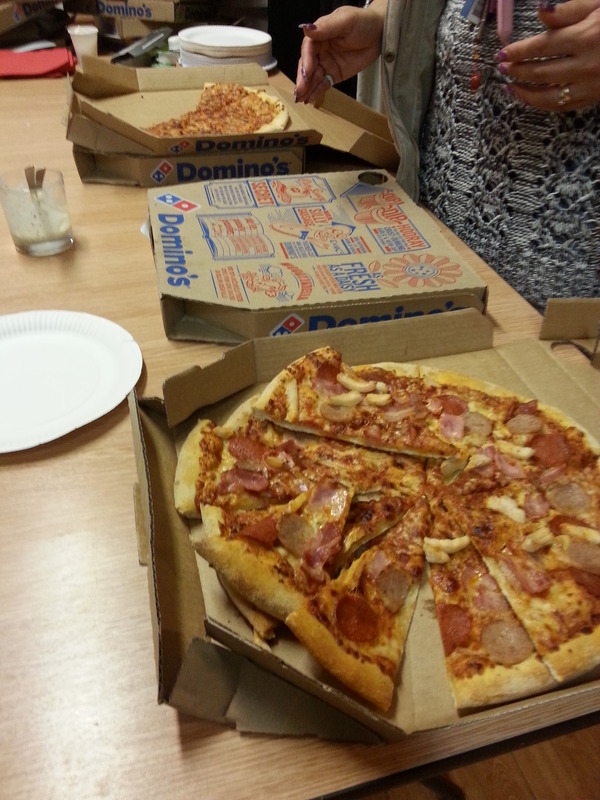 I was fairly greedy and had several slices of pizza. Next up was David Ashton chairing the event and going through the forum procedure and agenda for the day. 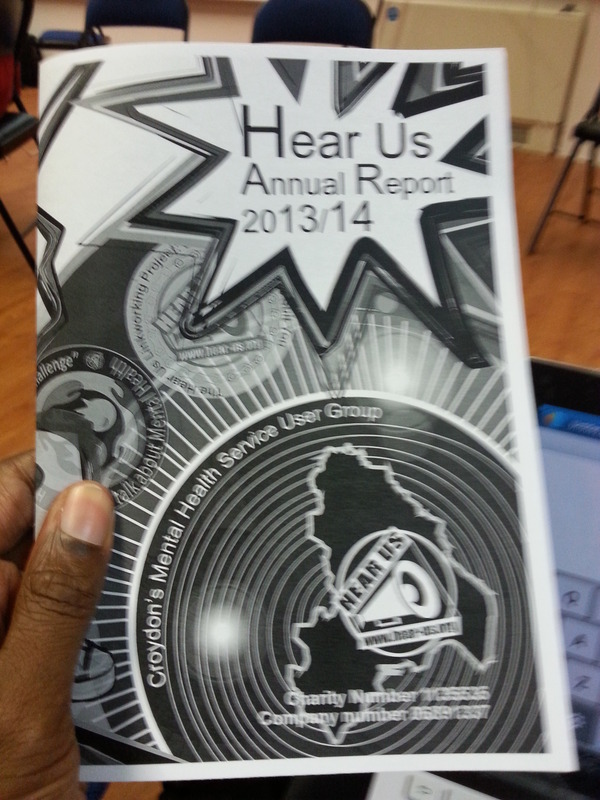 We discussed the Hear Us annual report for 2013/14. We were all handed out a copy of the report and members of Hear Us actually got the report earlier on. The report was an interesting read where we got to hear from the Chair, an introduction to members of the Hear Us board. We also got to read up about the latest developments on the Linkworking project and view the Hear Us accounts and financial review. At the forum we heard more about the members of the Hear Us board and some of them introduced themselves to the attendees of the forum. There were also some interesting and probing questions, here are some I picked up at the December forum. One member was interested in Hear Us aims on Autism. I remember one of the Hear Us workers replying to the question about how rigorous the process is on applying to become a trustee. 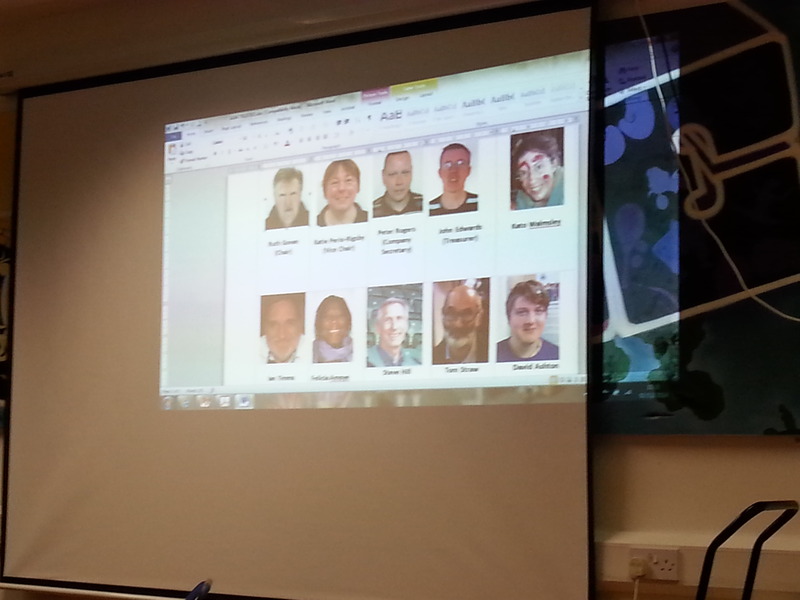 This was when some of the Trustees of the Hear Us board introduced themselves to us. One of them Felicia who was sitting next to chair of the forum David Ashton. Felicia explained how much experience she has within mental health and the mental health services. 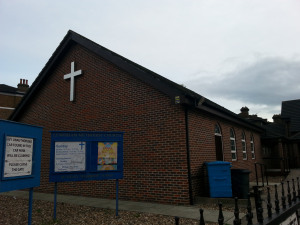 The attendees of the forum were asked if they were happy with trustees, which I felt was a good question and showed that Hear Us valued their member’s opinions. 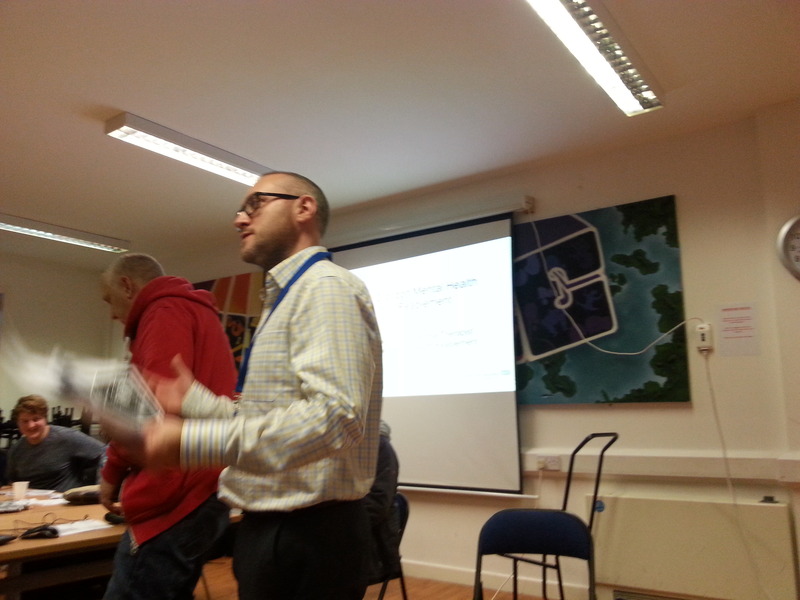 The first presentation at the forum was Lee Roach who is an Occupational Therapist on the Croydon Mental Health Reablement Project. Lee told us the following at the forum. How important it is for Reablement project to be inline with the new care act coming out in 2015. Lee mentioned that the Reablement services are still fairly new and there are not many reablement services out there. 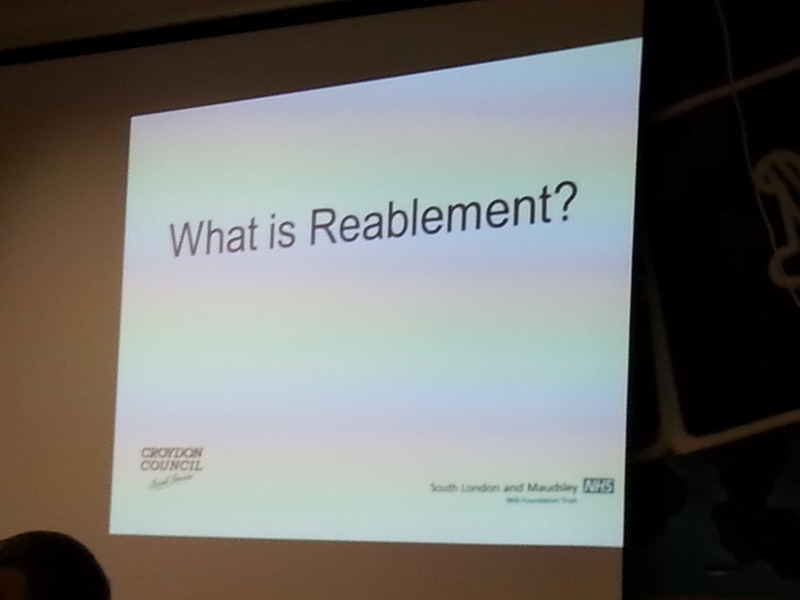 Lee also explained a bit about what Reablement actually means. Basically reablement means helping people regain the ability to look after themselves as in self care. 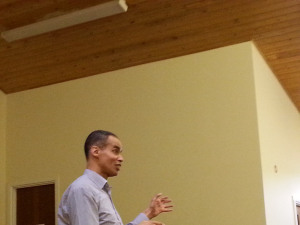 Lee then talked about how some are referred to their Reablement service although they do not take referral from GPs. However anyone can be referred from IAPTs or Community Mental Health Teams. The reablement project is actually a pilot, which means it is under evaluation at the same time to see how the project affects the community. The project has been running for 2 years and a report out in 2015. However some people at the forum were worried that people being reffered back to GP and they wondered why the GP can’t refer patients back to services. There also was other important questions aimed at Lee and they were. Why could the reablement project not run in conjunction with services. – It was mentioned that it is important to state the reablement service does not deal with medication and those referred are at a point of recovery when being reffered to the service. However someone followed up on the answer and stated if you do not support on medication, what happens if there are medical issues after refferal? One member of the audience felt that the Care act must be empowering to Service User and that they feel dis-empowered in the London borough of Croydon, he wondered who is making these decisions on these services. – We are under a steering group under Mind and HearUs, take makes sure our services are in the best services levels in regarding service users. Another interested discussion was on the option on ‘easy in easy out’ service over in Purly where the GP refer back to team faster if they are concerned, this is where urgent appointments available in 7 days. A felt another good question was someone asking what are the evaluation of the service so far? Lee stated so far there are positive findings of the service, but they need to engage with carers more. Plus they are also focusing on leisure and work of people’s lives, plus learning new skills (reading and writing, new courses, yoga, exercise). One last question I noticed was that one person was worried about those who do not have a care coordinator, but were passed on to outside agencies, seems two-tiered group. After a short break and some networking we moved on to the next presentation, which was presented by Susan Grose the Croydon CCG mental health Commissioner. 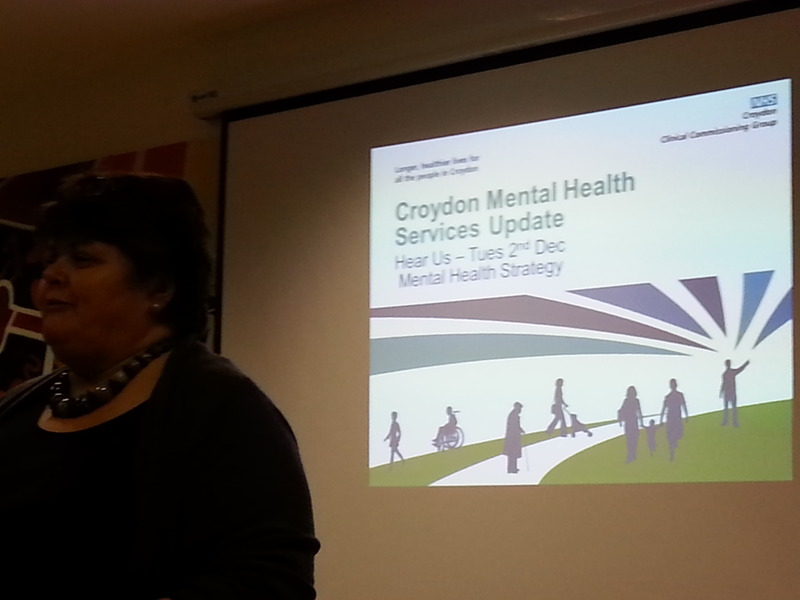 Susan spoke about the Croydon CCG MENTAL HEALTH STRATEGY and wanted to hear the views of service users, carers and members of the public. 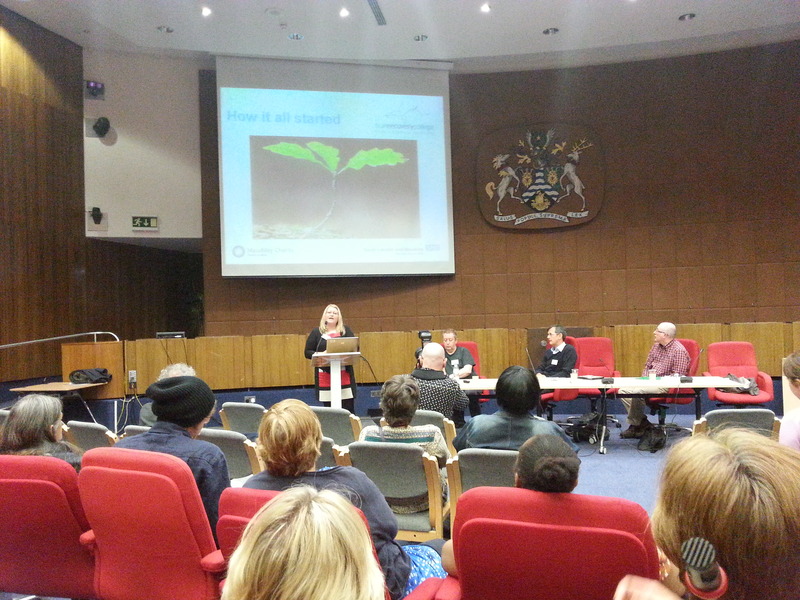 Susan spoke about how the borough of Croydon is changing and is more likely going to be more deprived. One in Six adults in Croydon has a hemtal health need and it is stated that Anxiety and depression are projected to increase by 5%. Susan mentioned the need to improve integration of mental health with physical health, which is something I clearly agree and support. 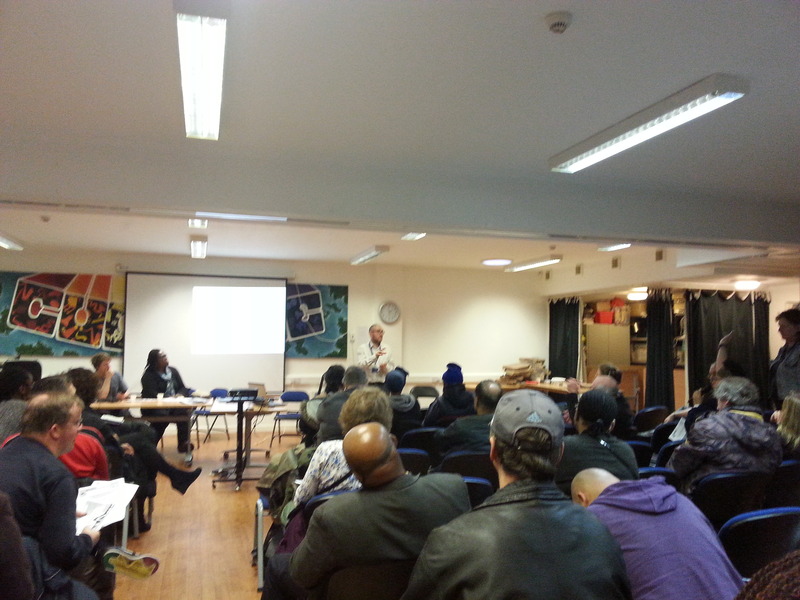 Susan also spoke about the need to better address the needs of BME communities where there is a 40% of acute admissions. Croydon CCG have also invested in the use of IAPT services, which basically means Increasing Access to Psychological Therapies. Susan then moved on to presenting the need to ensure the wider determinants of health to be addressed, that being housing, education and employment support. Plus also addressing variation in primary care and easy access to whole life support to improve and maintain mental well being. 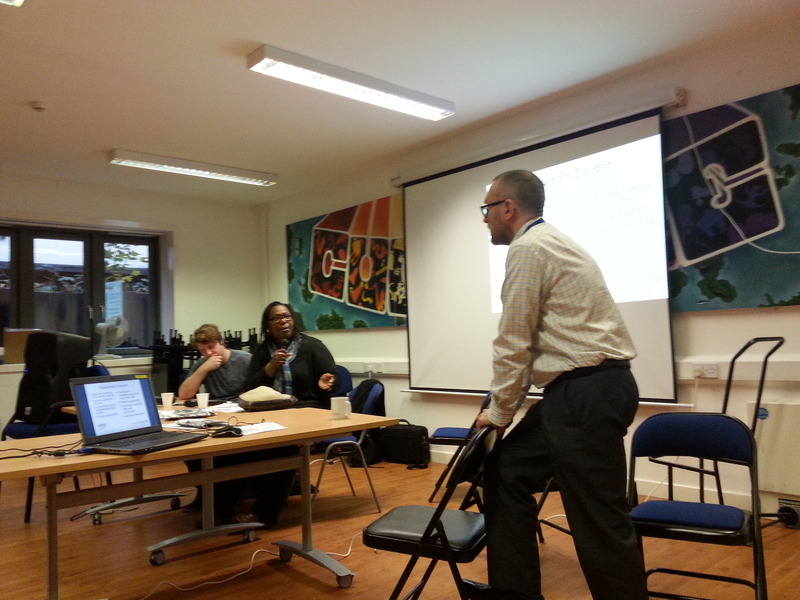 Croydon CCG have been busy consulting with service users and stakeholders, they have held a number of workshops with GPs and developed associated strategies for CAMHS and OAMH. They have committed to the investment of £5.2 million to stabilise the system and invest in community services, plus invested £600K in IAPT services. 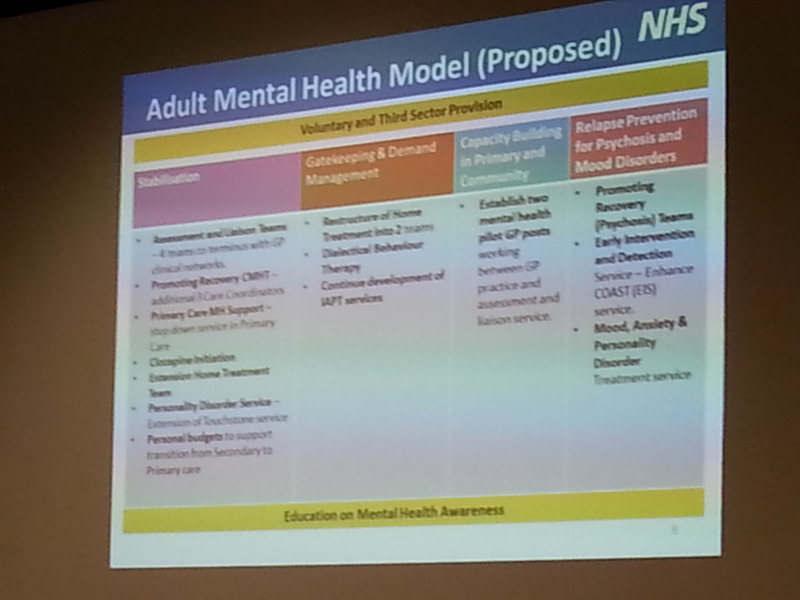 Susan spent some time at the forum showing us the Proposed Adult Mental Health Model where we were explained the steps on stabilisation of the mental health services in Croydon and how gatekeeping, capacity building and relapse prevention can fit into this model. Some of the Key aims of the strategy is to ensure voluntary and third sector provision works alongside with primary and secondary health services. Another aim is to improve the quality of life of people with mental health needs, improve access to mental health services, strengthen partnership working and ensure there is education available on mental health awareness. The next steps for the strategy is to develop a strategy action plan with service users and stakeholders although I do hope they involve the carers. Other steps are to continue to work in collaboration with other CCG commissioners and also refine the community adult mental health. So what questions came up in the discussions? One person was worried about waiting times on IAPTs, However it was explained that lack of funding was a result of this and they are working to improve waiting times. Another question was on the cutting beds to increase throughput was not the best idea, the person felt it is best to keep those beds, the commissioner agreed with this statement. A good question was on the problem of hostel’s closing and the concern of hostel provisioning. It was stated that there was worry about many of the hostel’s are privately owned, need to look carefully at where those in those areas, receiving services in the right setting, its not an easy problem to solve, so no answer as yet. Another interesting question was on how to access dementia services, which takes too long. Susan did agree and stated that dementia is high on national agenda. The UK is an ageing population and dementia is a silent time-bomb, we need to educate people. There was also many other interesting questions, but overall I really enjoyed the forum and look forward to the next forum, I felt David chaired the forum very well and the staff were friendly and kind. 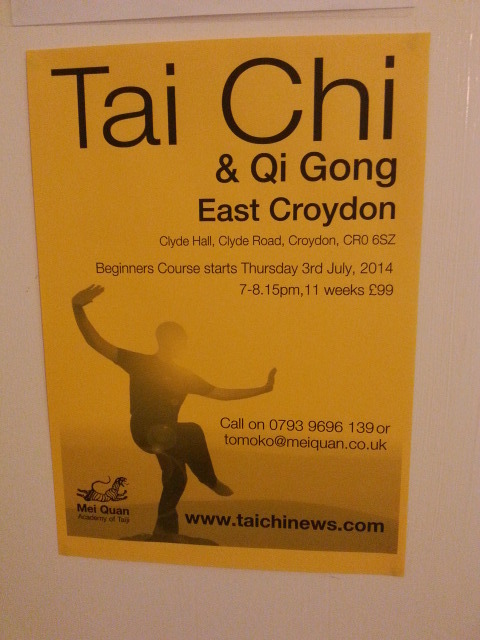 This entry was posted in Event reviews and tagged croydon ccg, mental health, mental health forum on December 4, 2014 by mmckenz11.